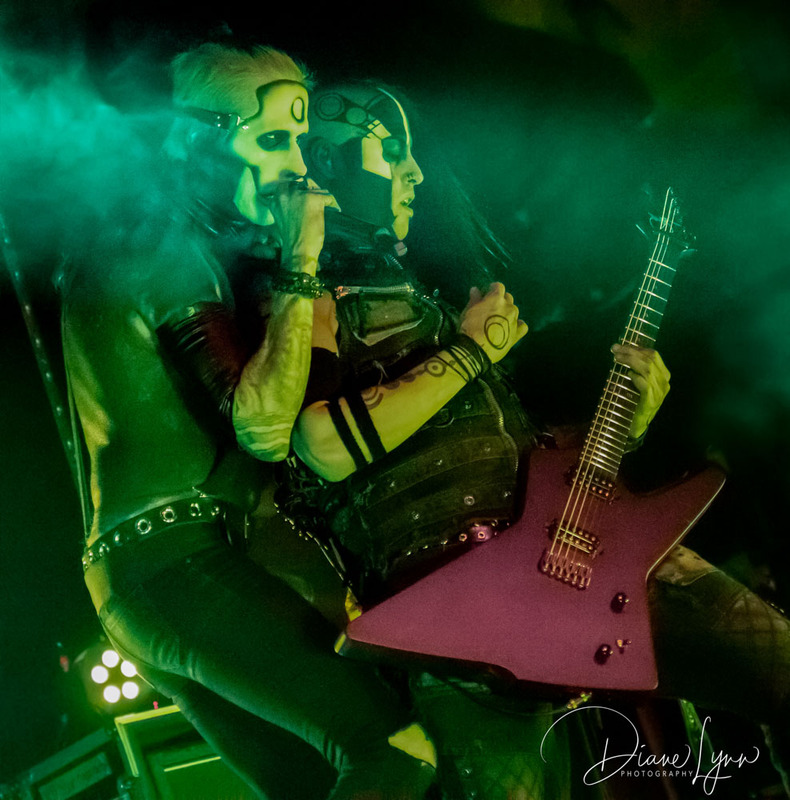 Wednesday 13 and Raven Black. 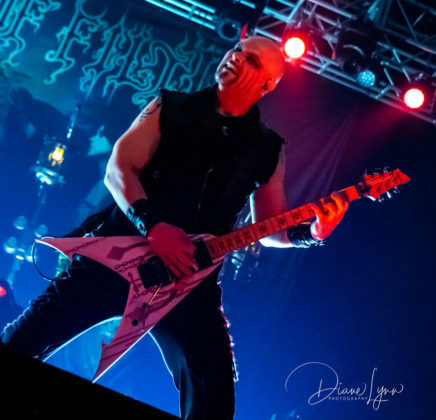 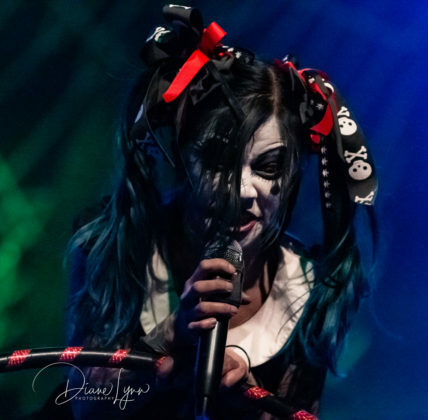 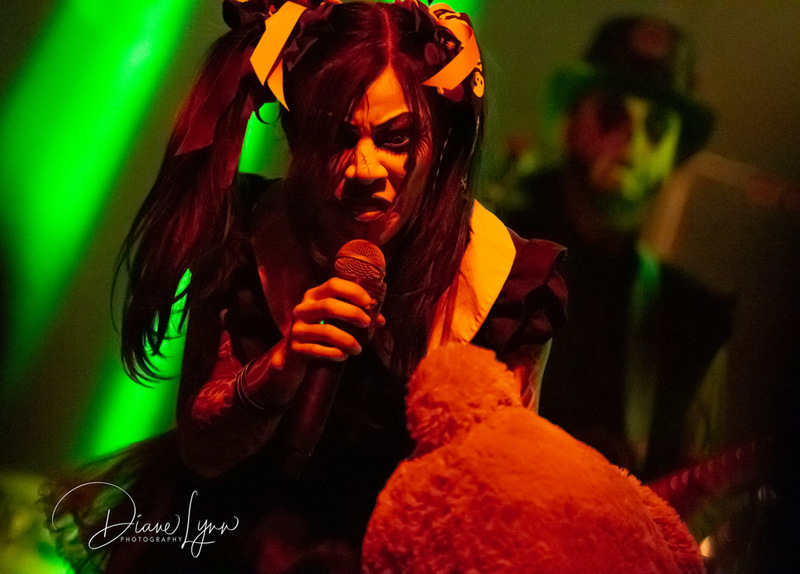 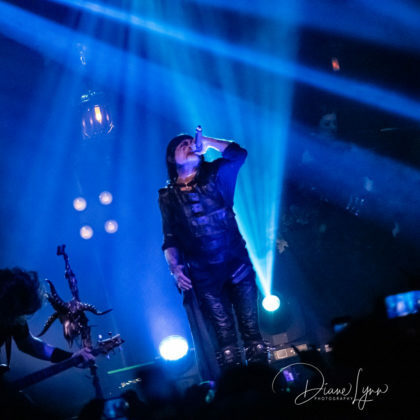 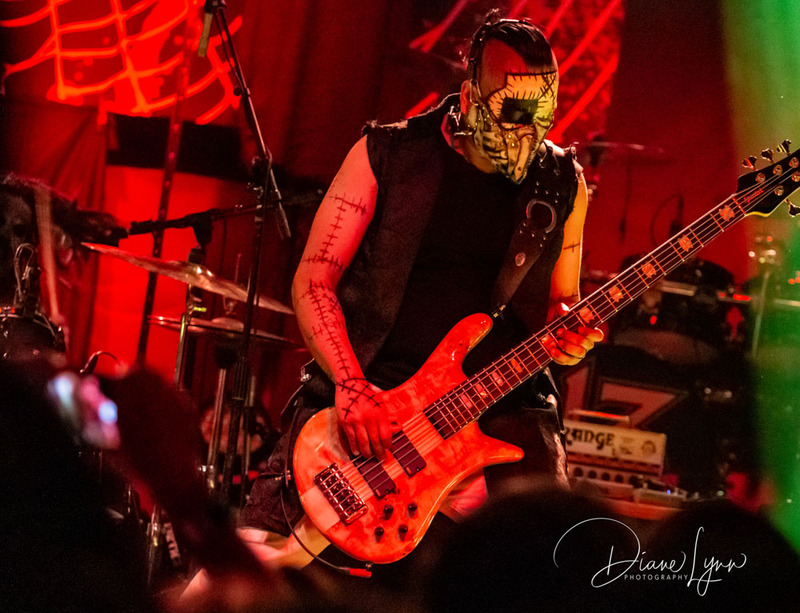 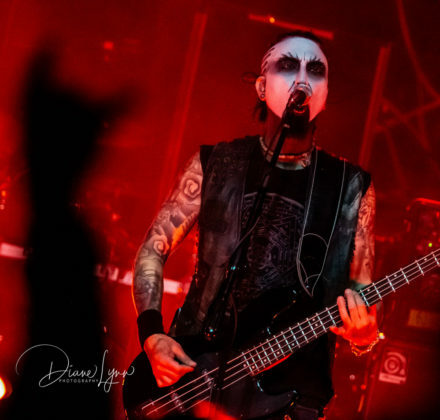 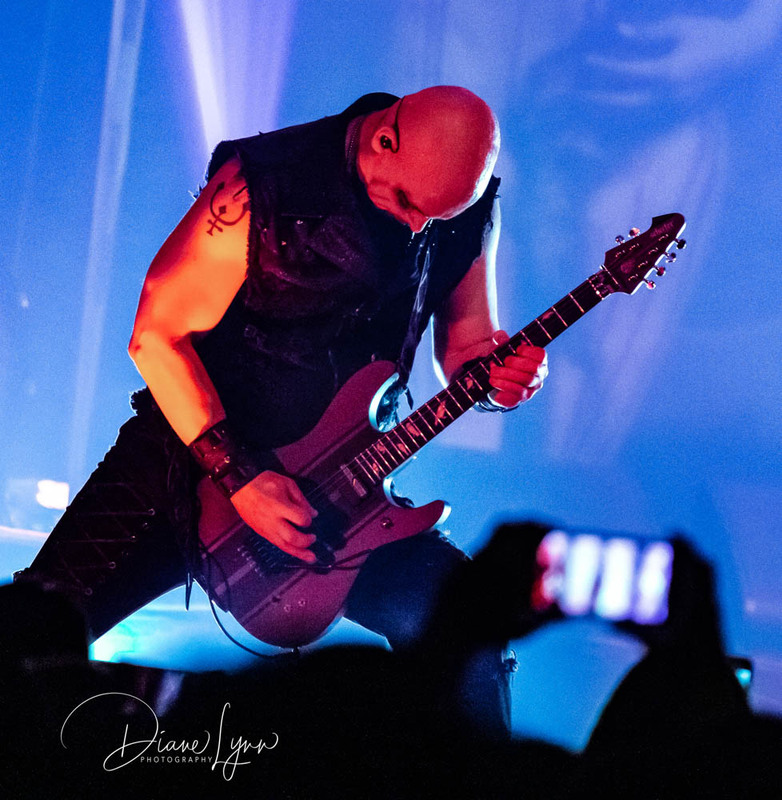 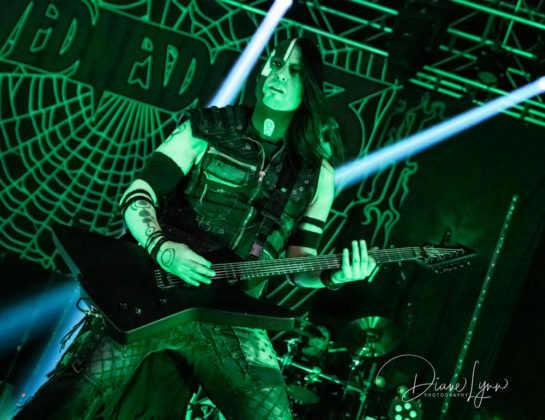 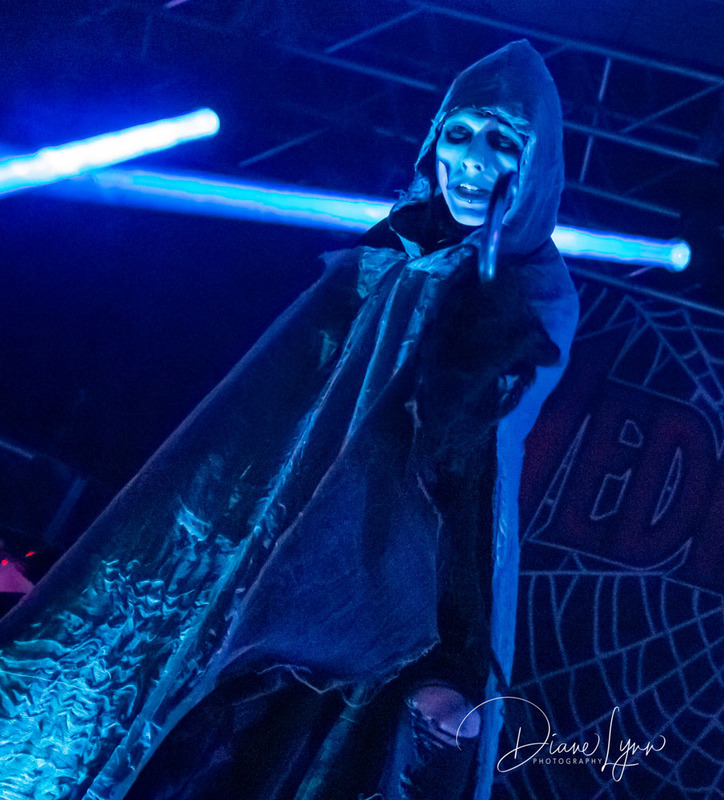 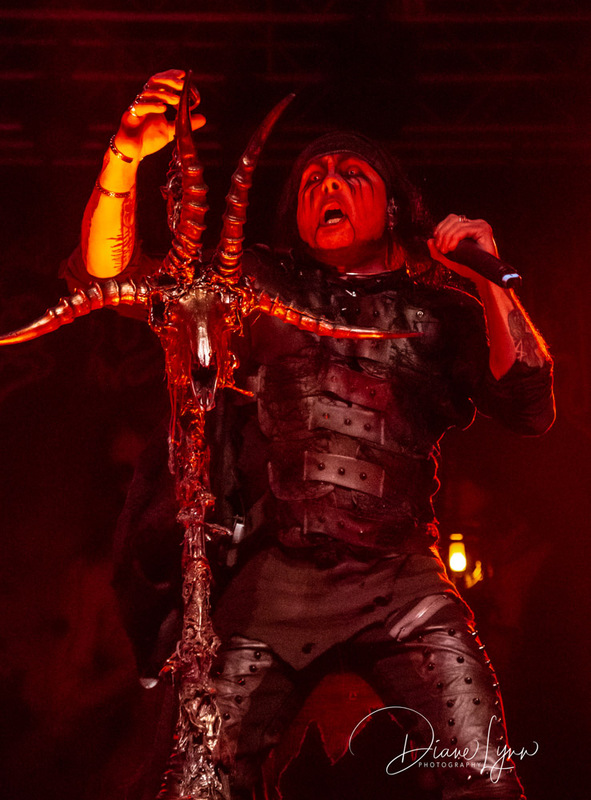 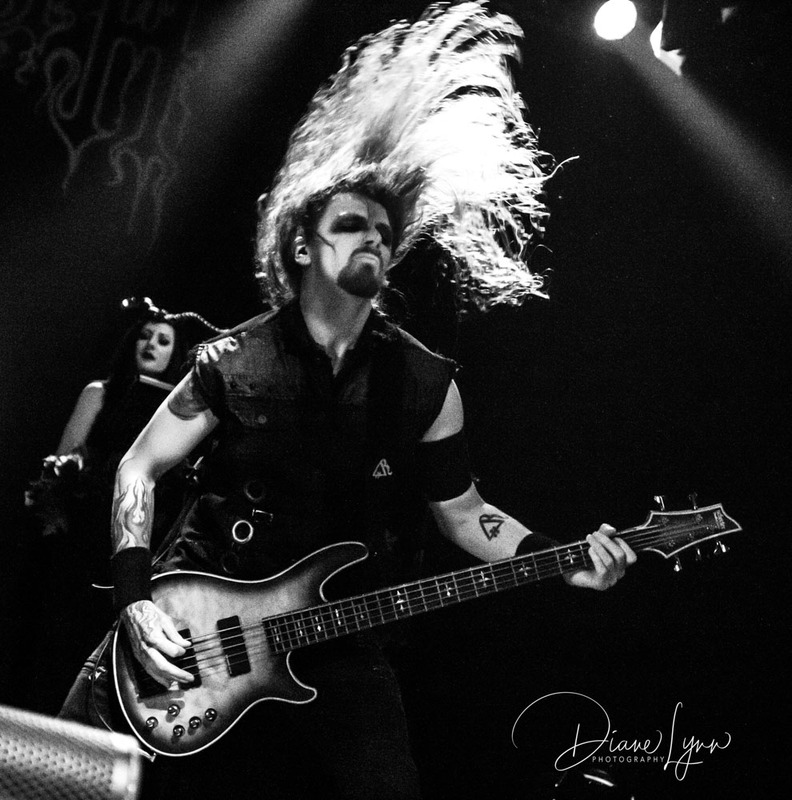 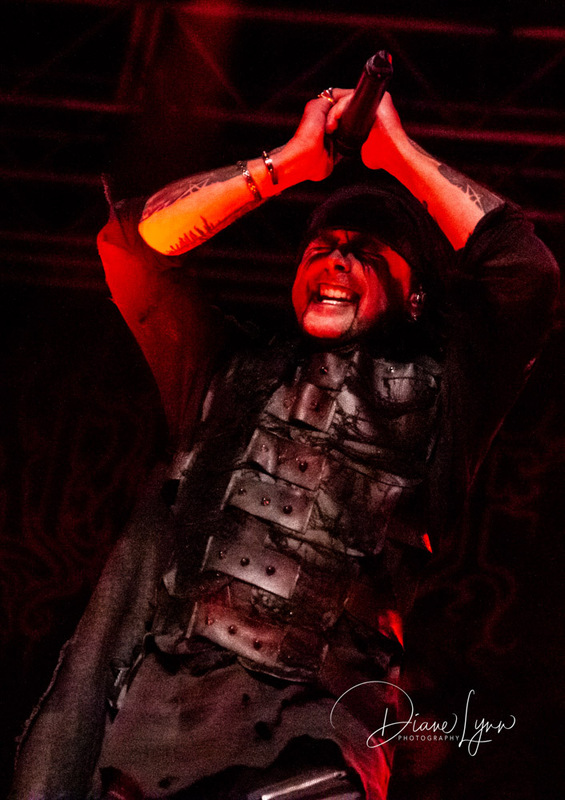 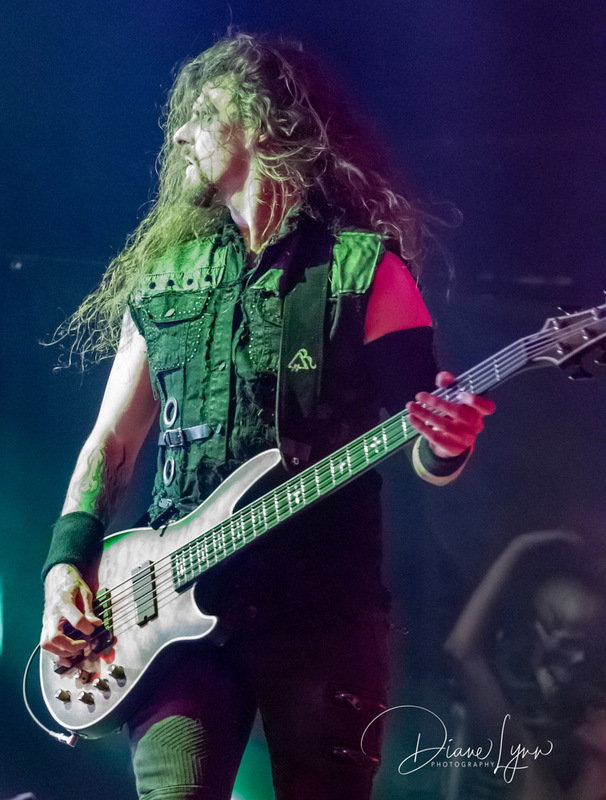 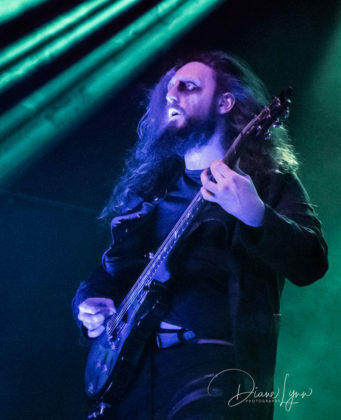 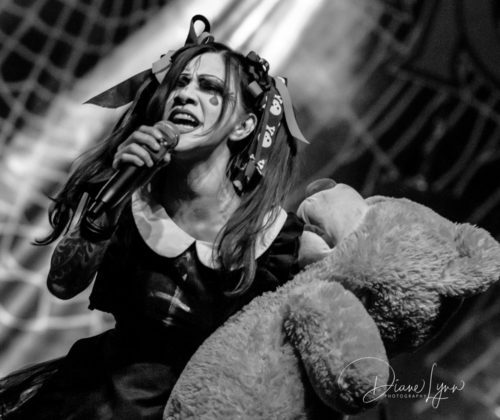 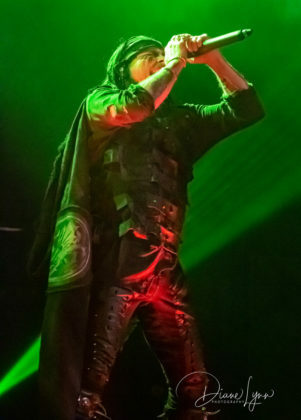 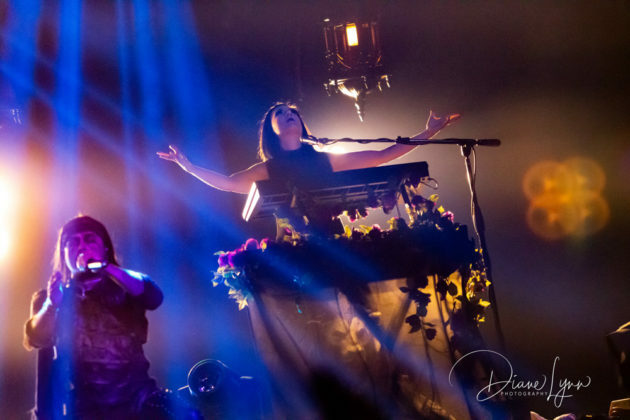 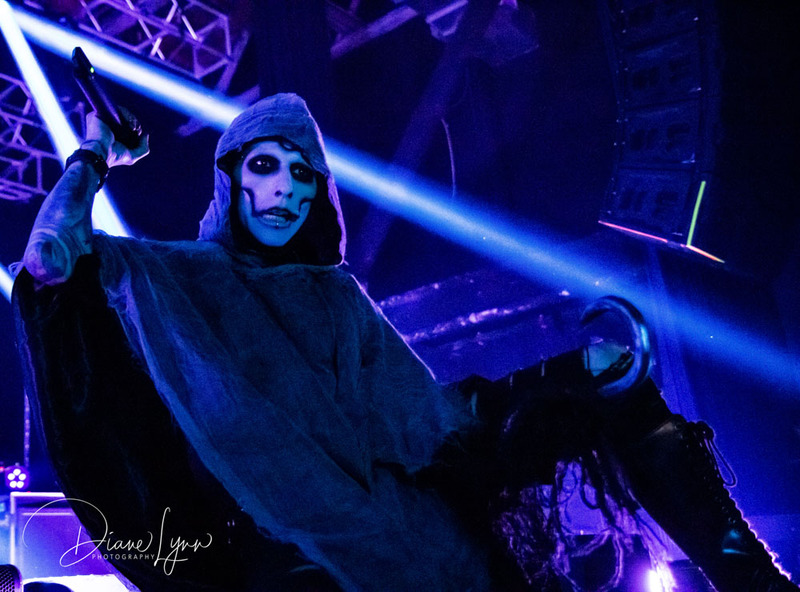 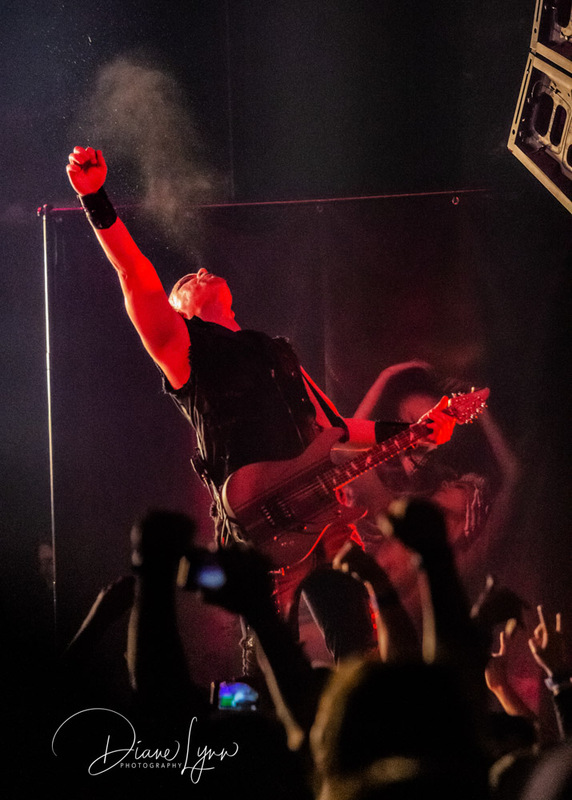 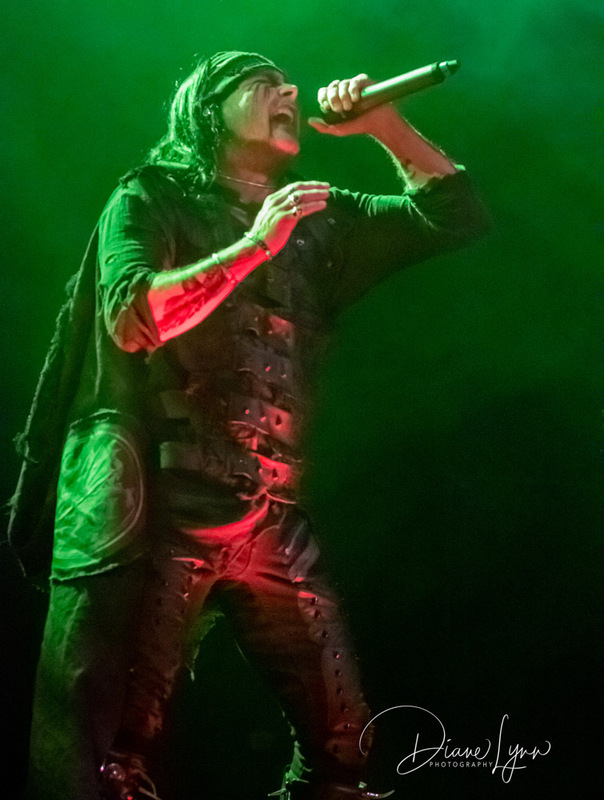 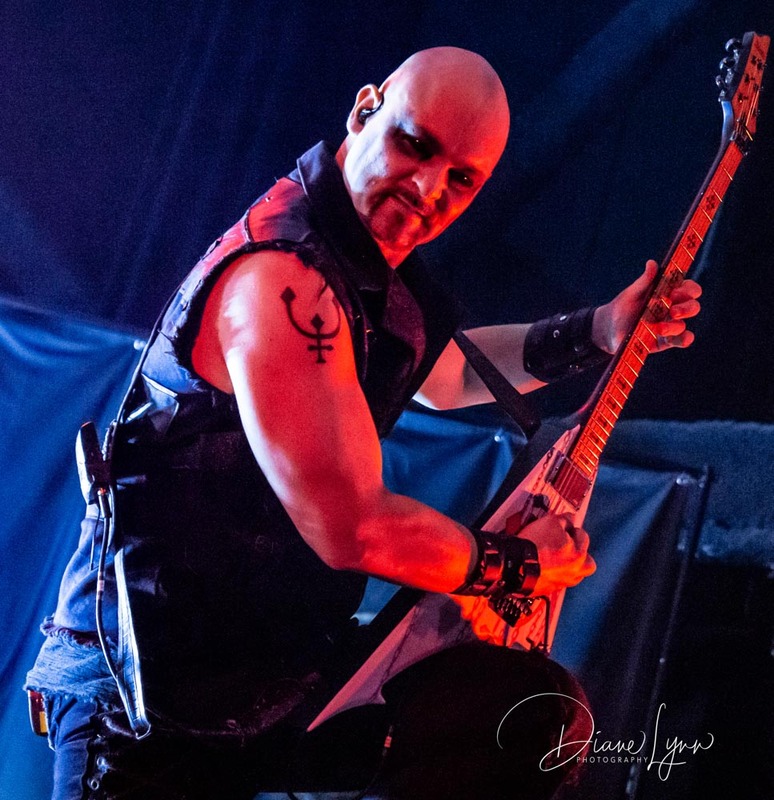 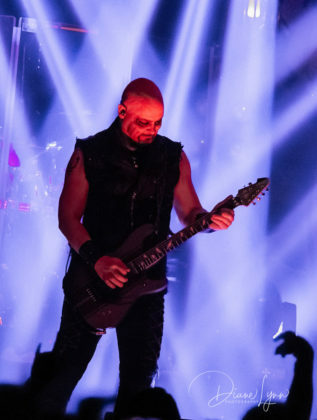 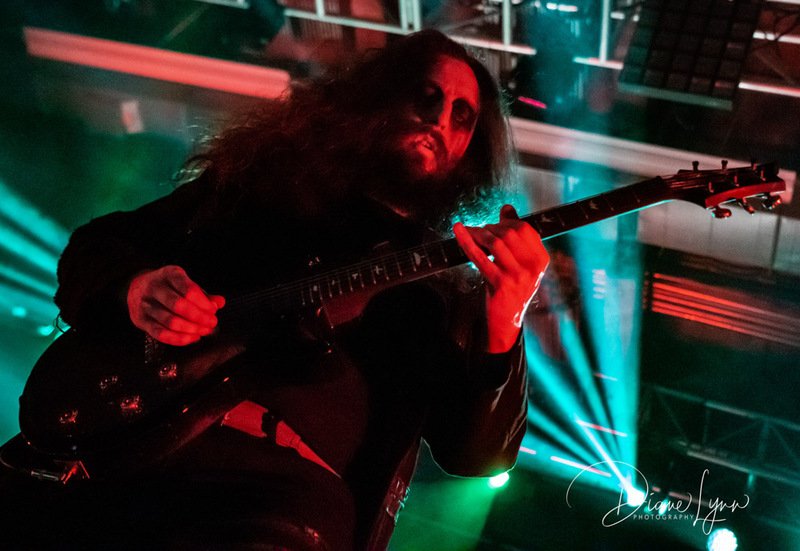 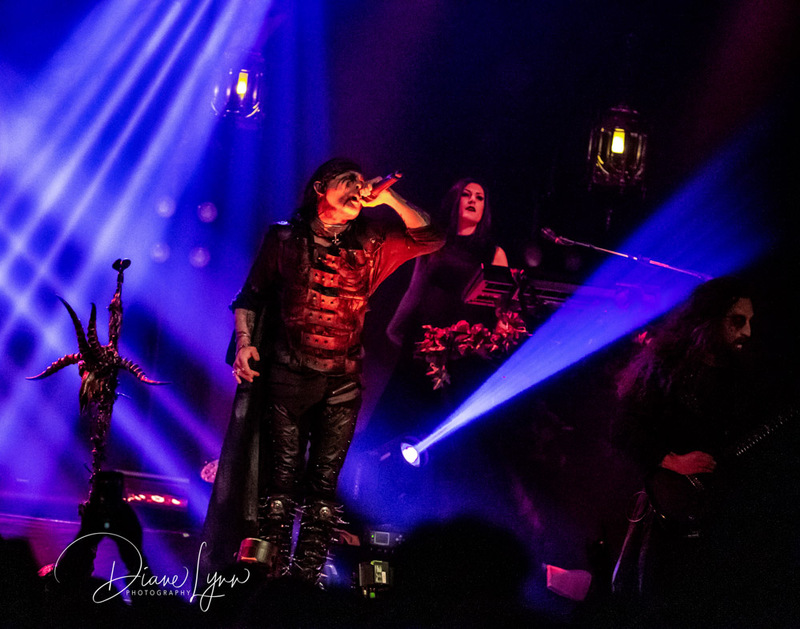 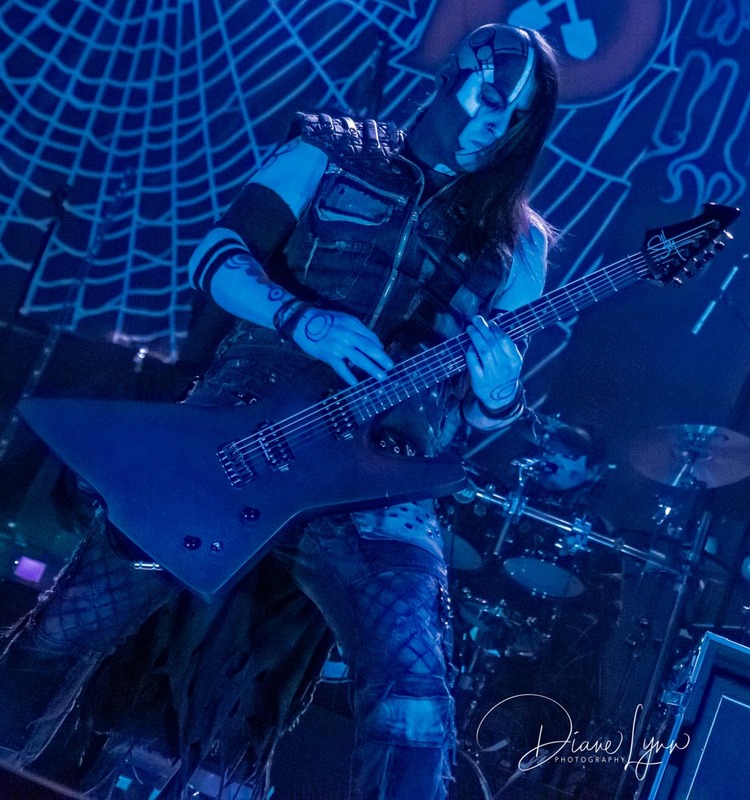 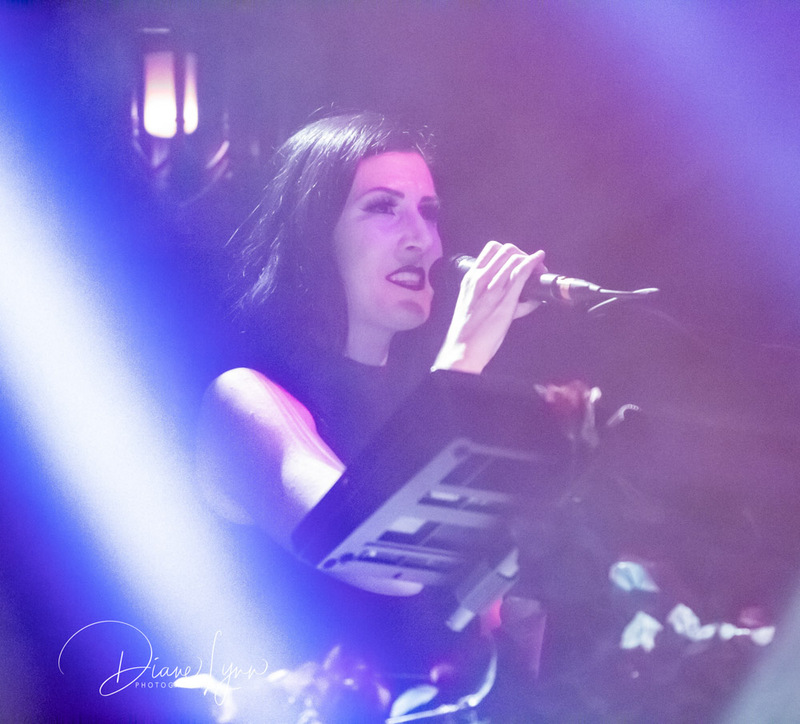 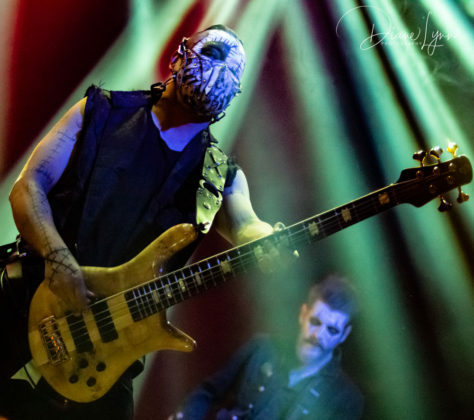 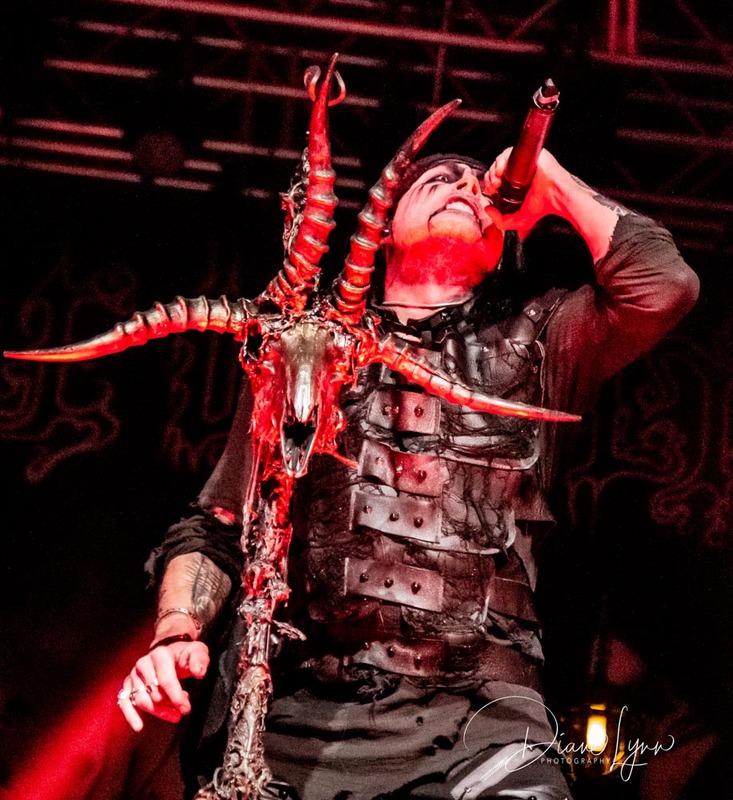 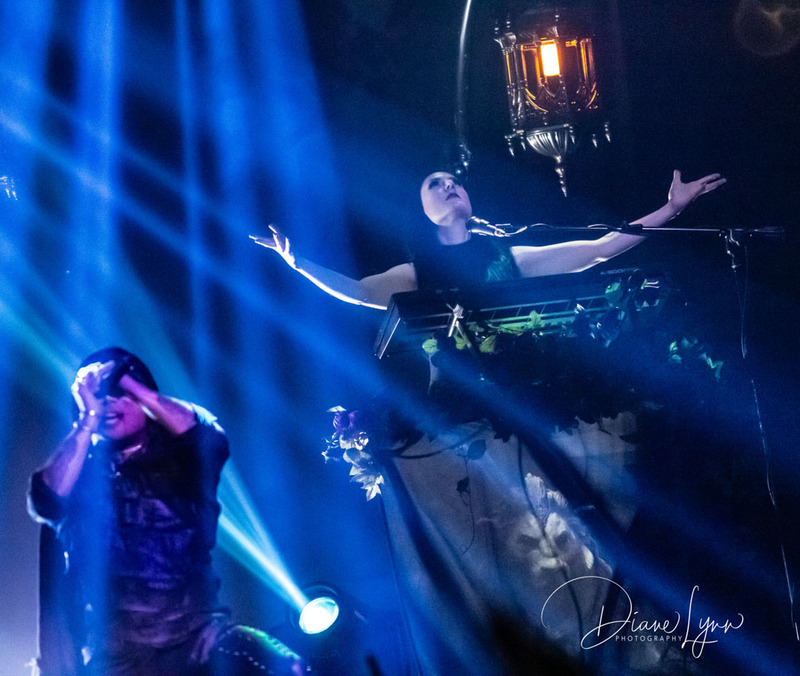 Cradle of Filth have embarked on the second half of their North American tour with a stop at the House of Blues in Anaheim and brought metal mayhem to a whole new level! Having never heard of Cradle of Filth, I wasn’t sure what to expect but I was quite intrigued when I saw the promo shot for the tour and decided this is something I must see! 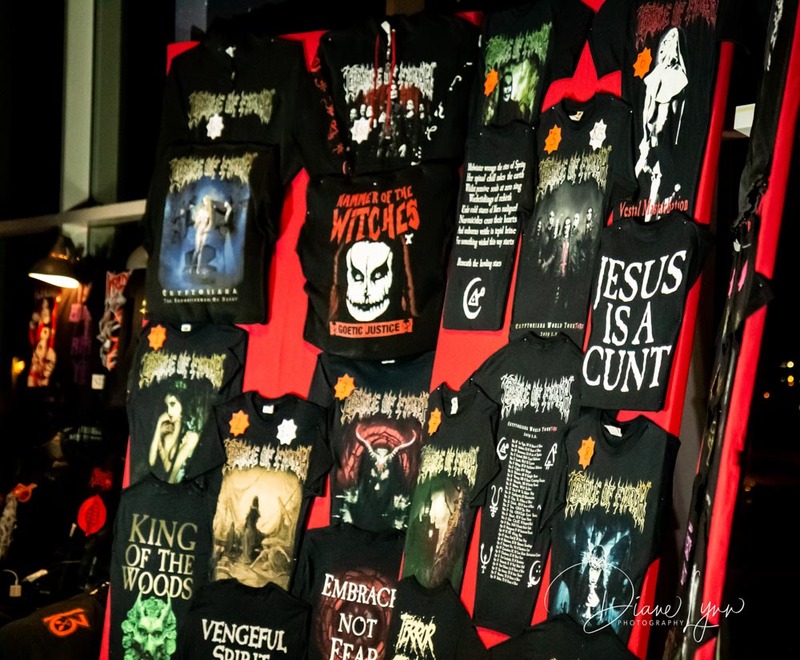 As I made my way into the venue I noticed a very large crowd gathering just to the right of the main lobby, as I walked closer I could see that it was the merchandise booth and the fans were lining up several deep to purchase the bands very unique and somewhat controversial tour shirts. 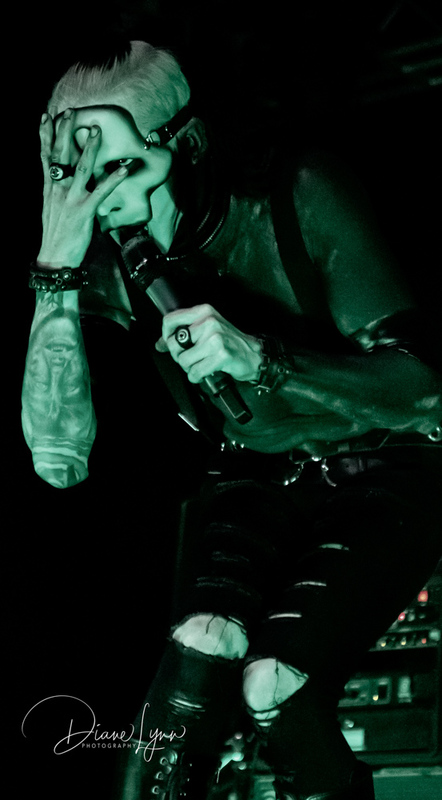 They had plenty to choose from and they were going fast! 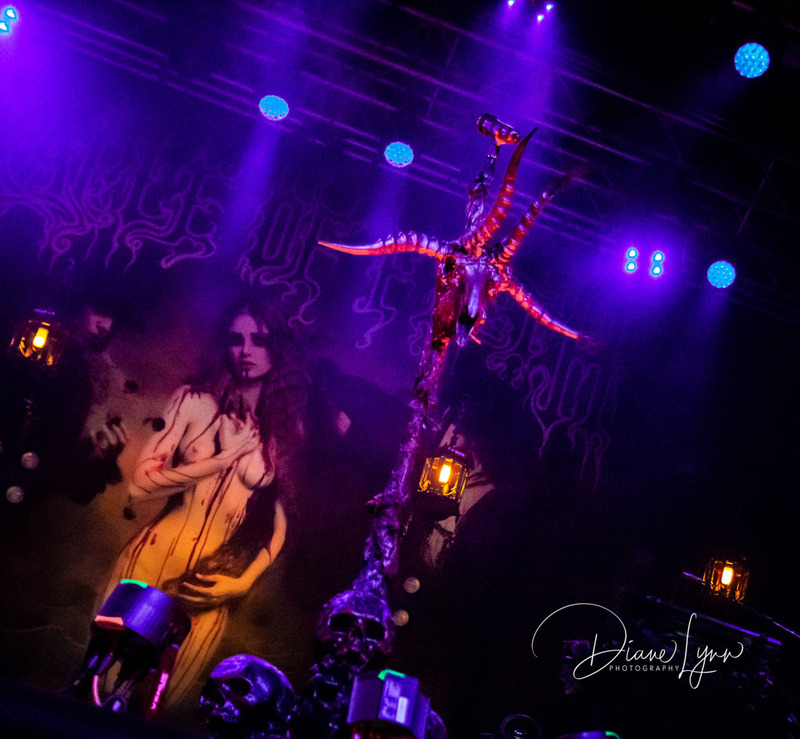 The stage was set in a very dark and eerie fashion reminding me of what you would see in an old Dracula movie; cold, damp and just a flicker of light coming from the steel lanterns sparsely placed around the stage. 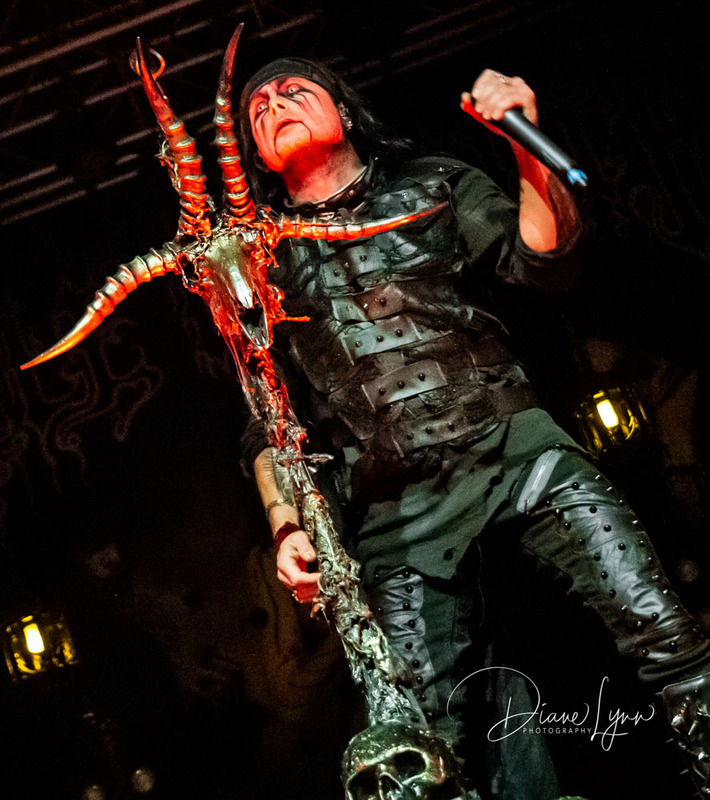 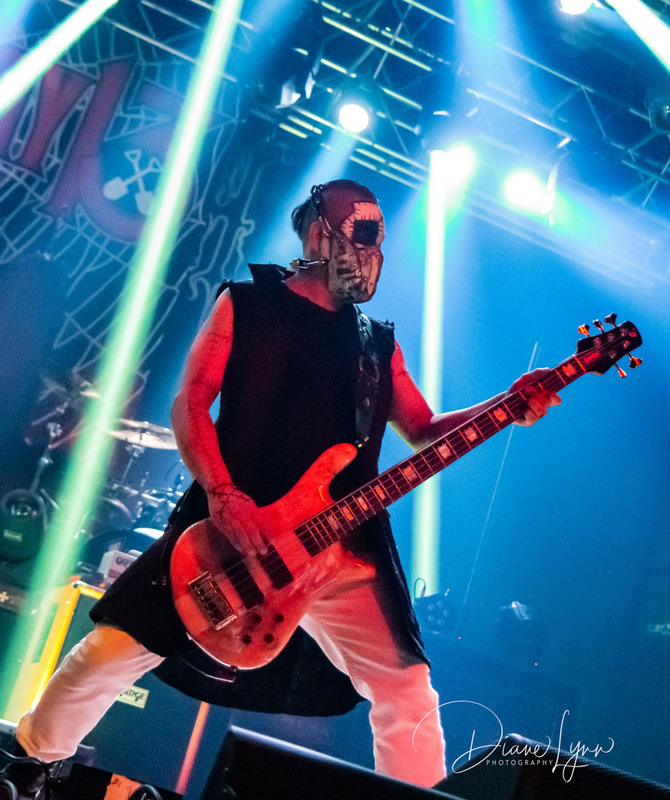 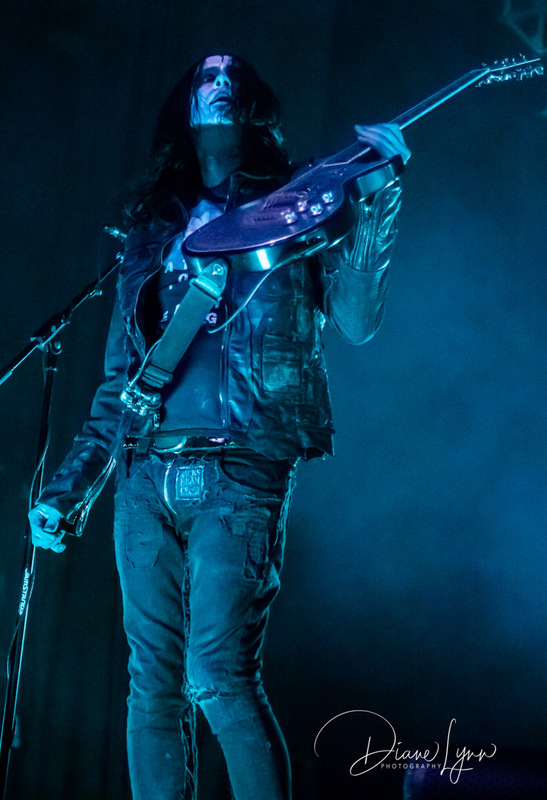 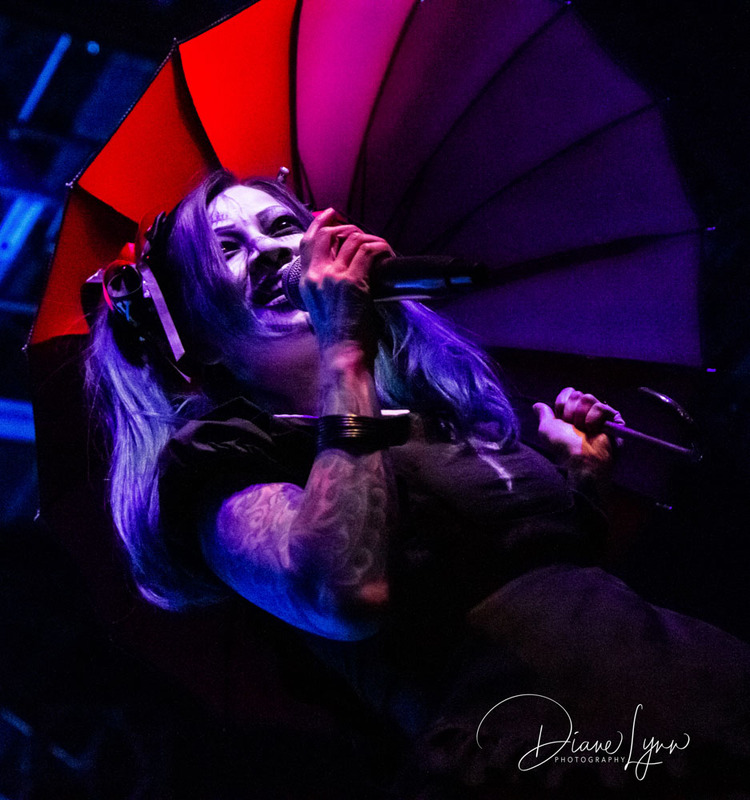 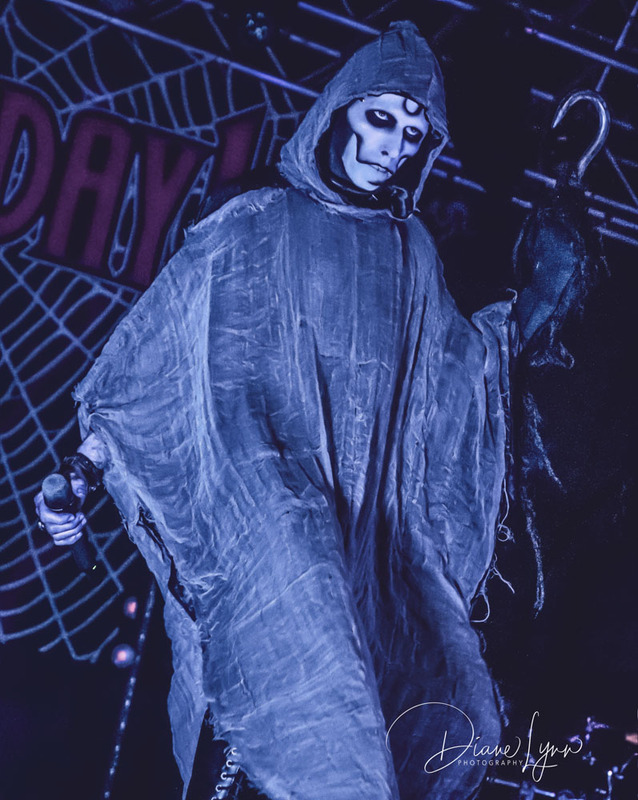 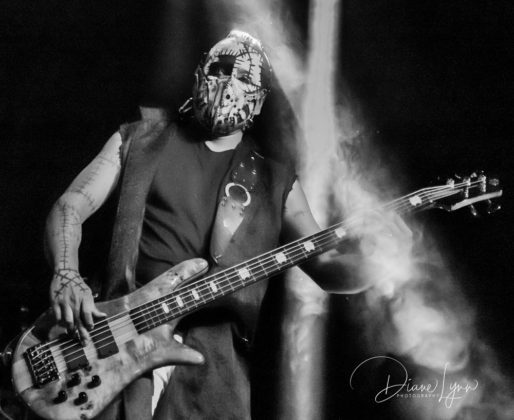 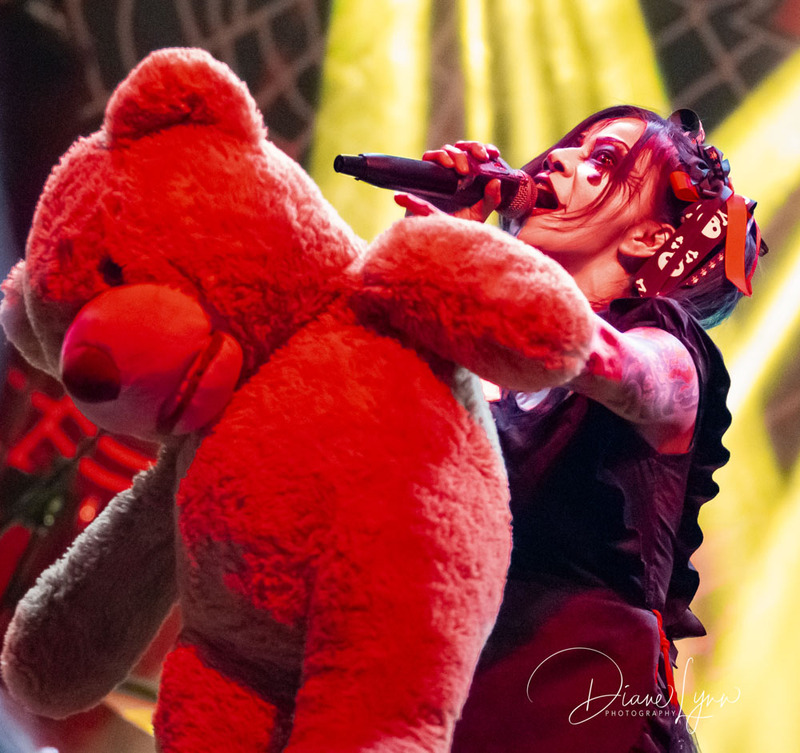 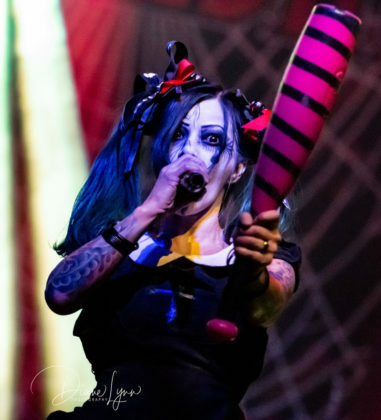 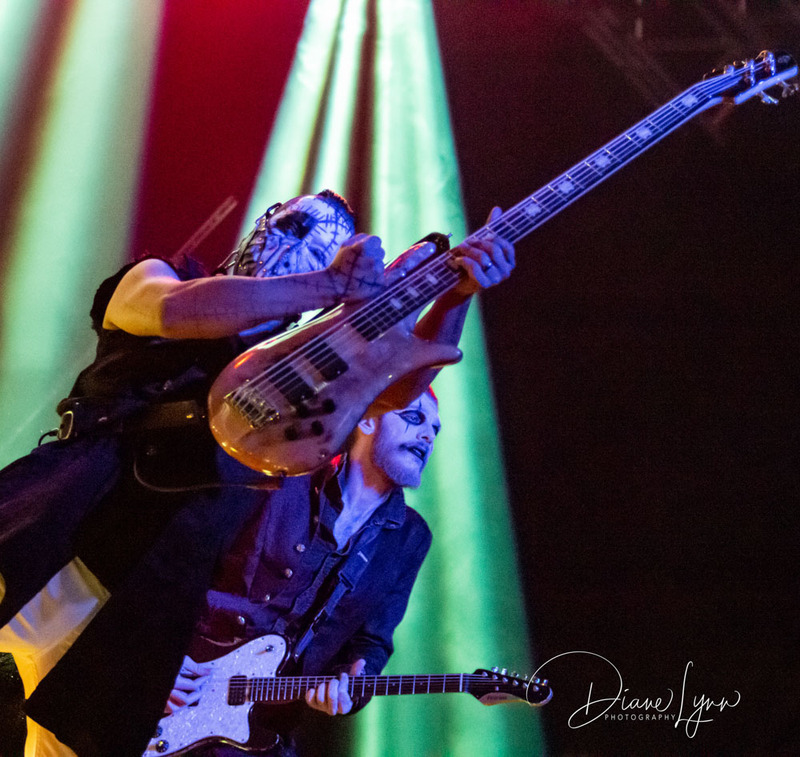 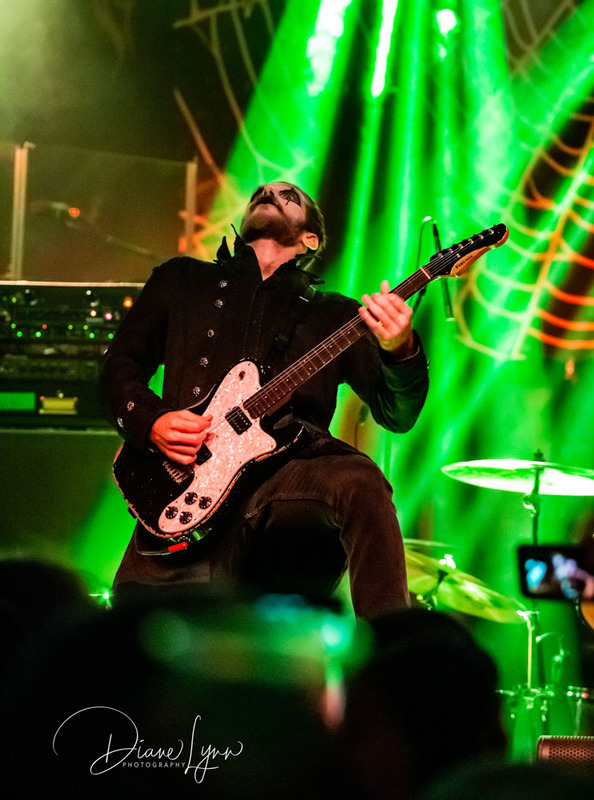 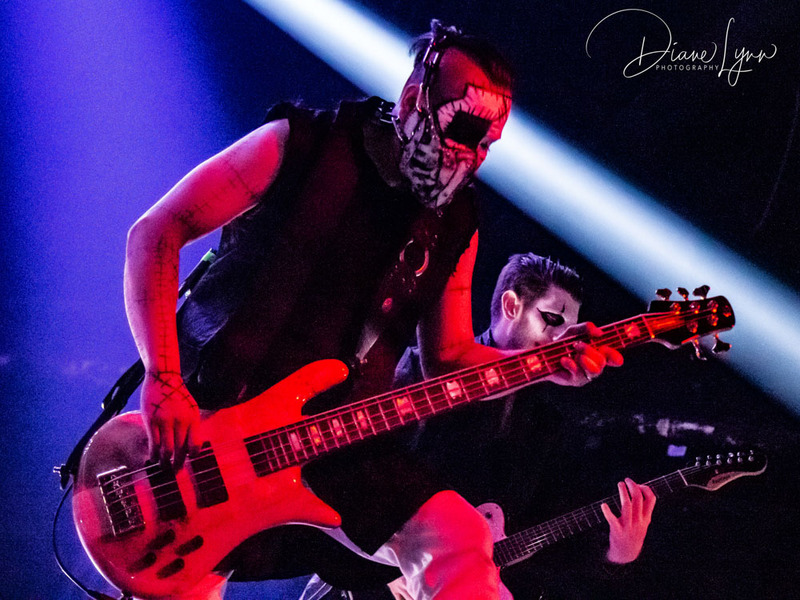 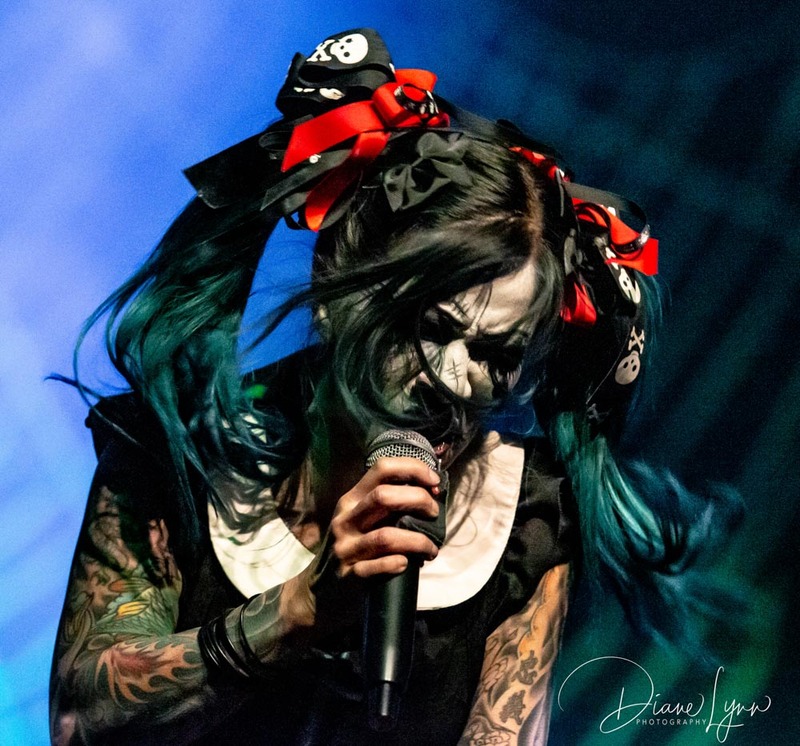 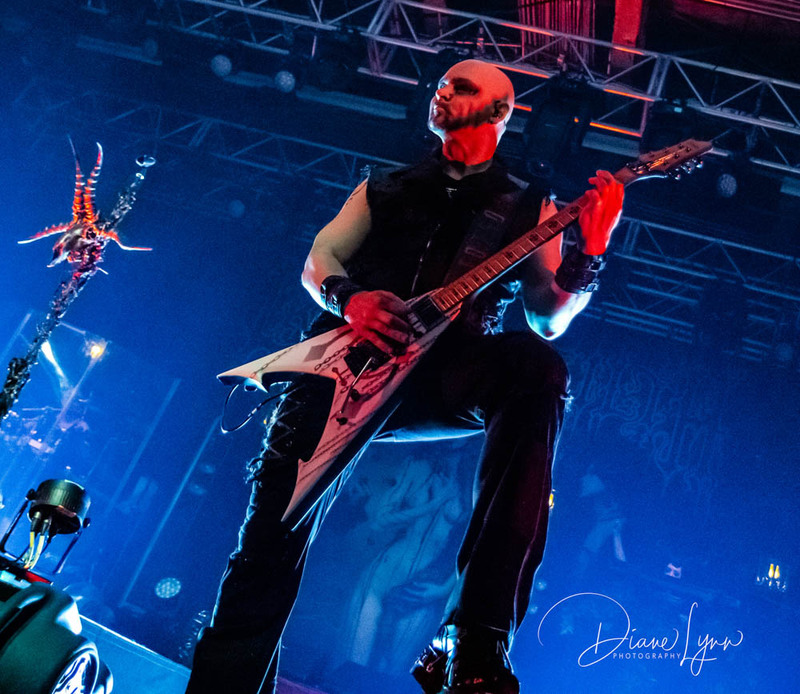 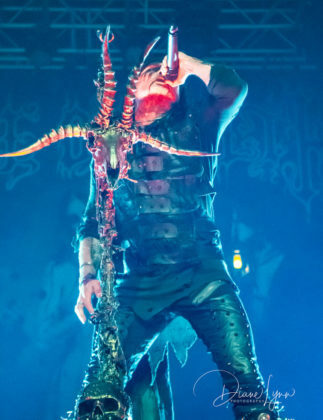 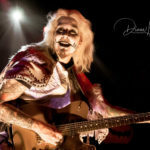 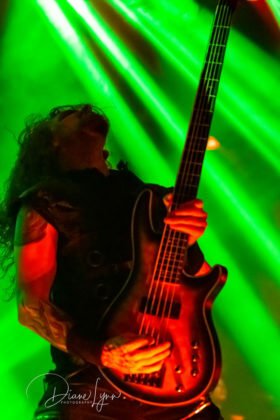 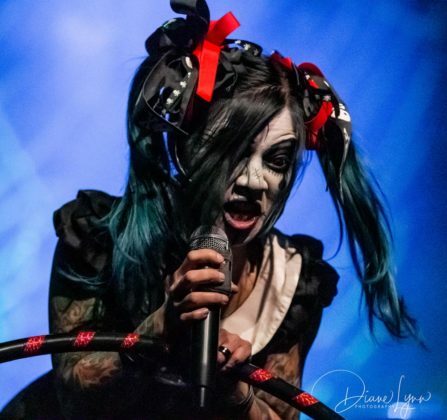 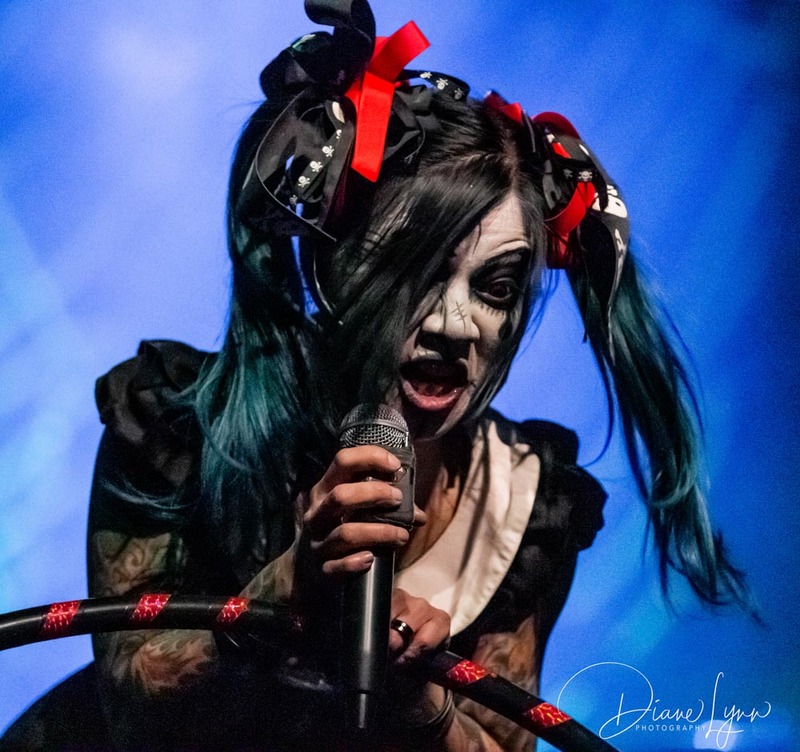 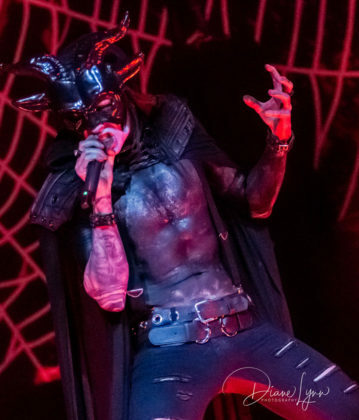 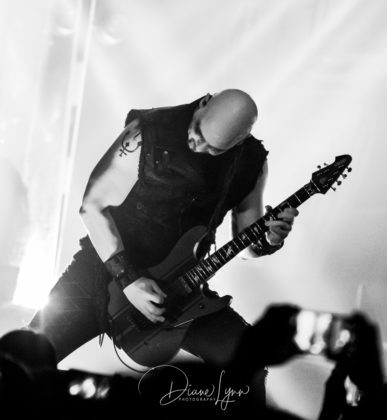 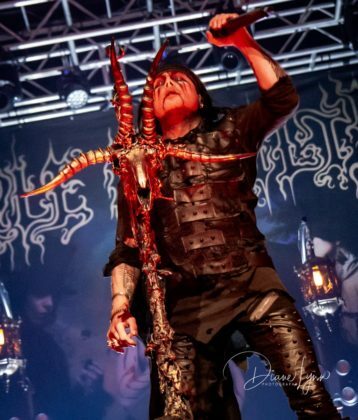 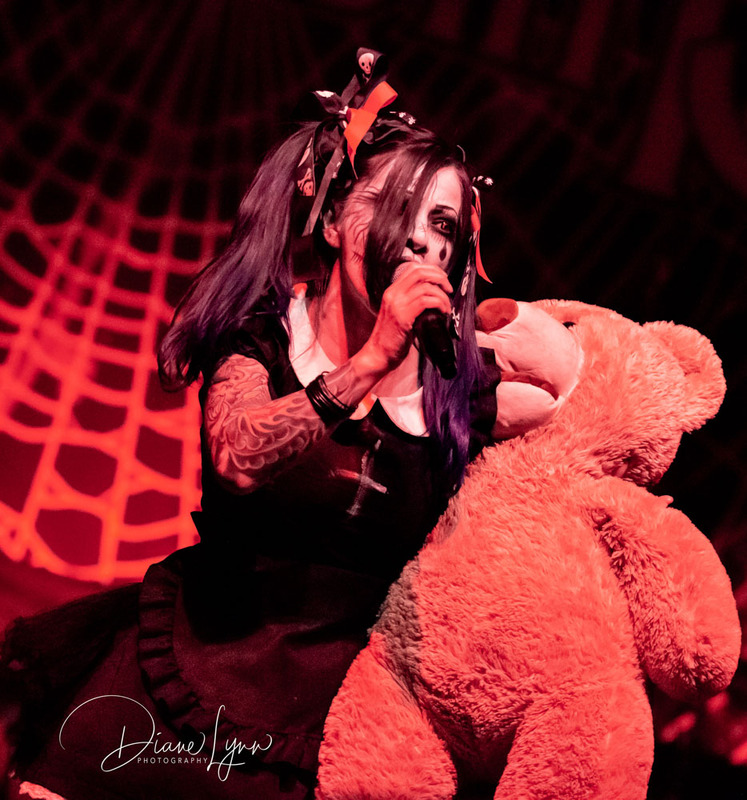 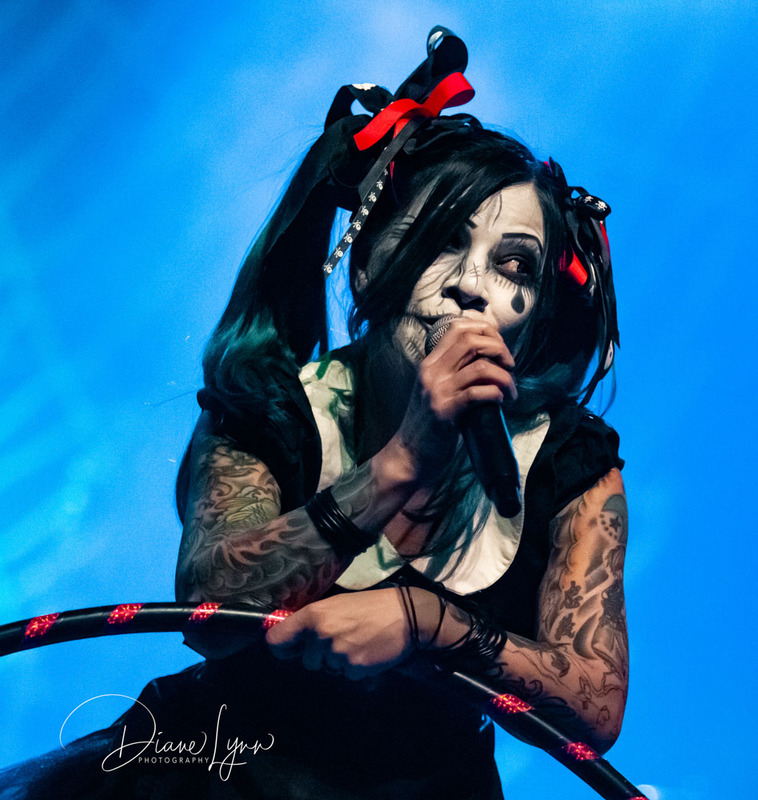 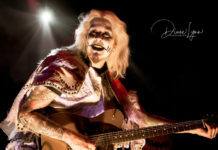 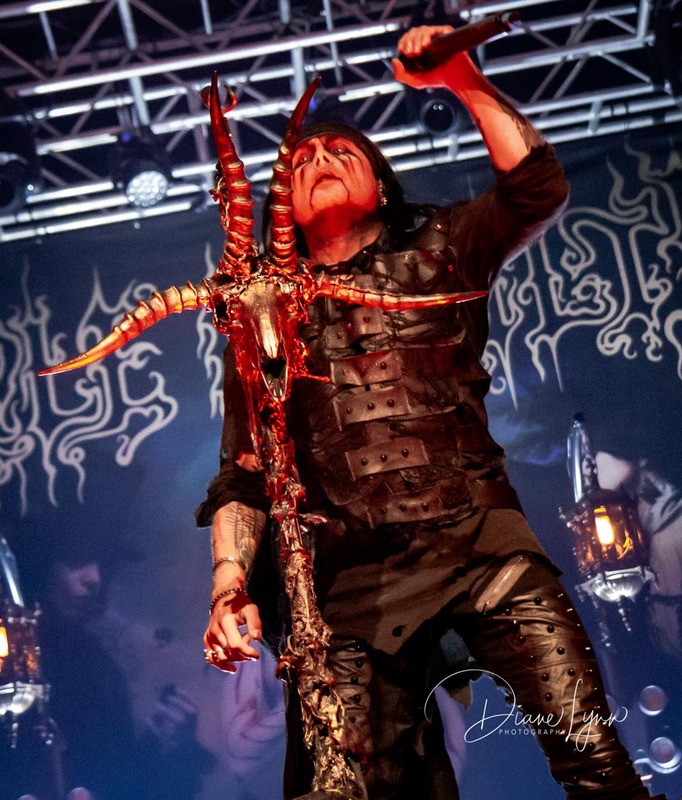 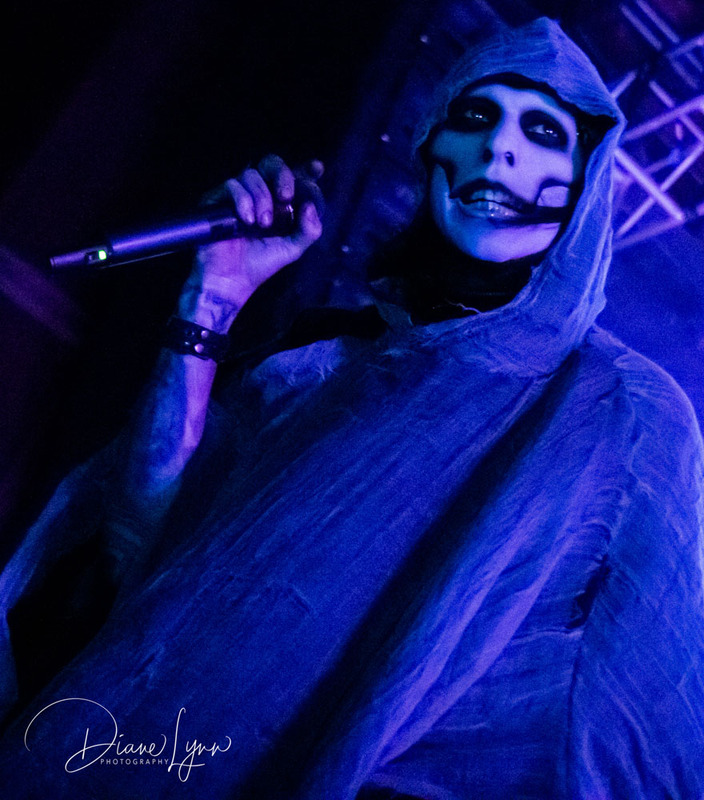 As the elaborate mic stand used by Dani Filth was brought out and placed with care, I knew then this would be more than the usual metal show, it would be a visual feast and the music would be the main course. 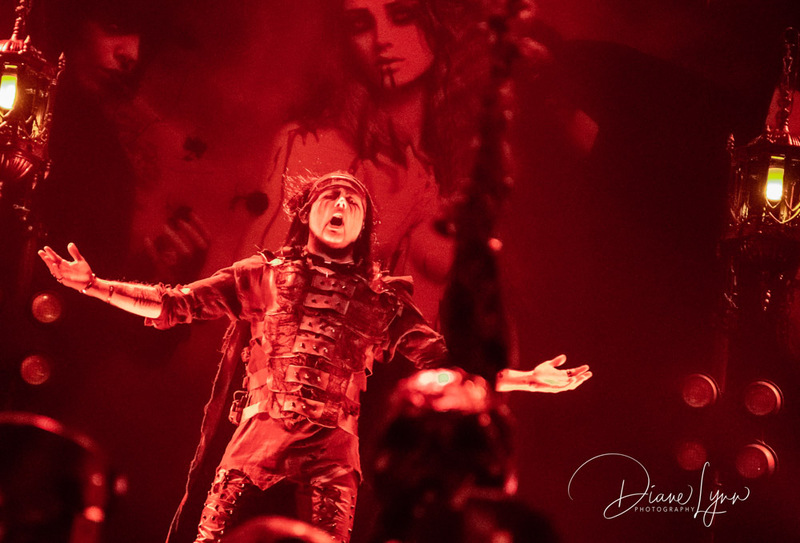 This was a well-choreographed, theatrical show that seemed to play as a ritual of sorts. Each member moved around taunting you, drawing you in closer as their leader stood center stage, reining over all the Madness! 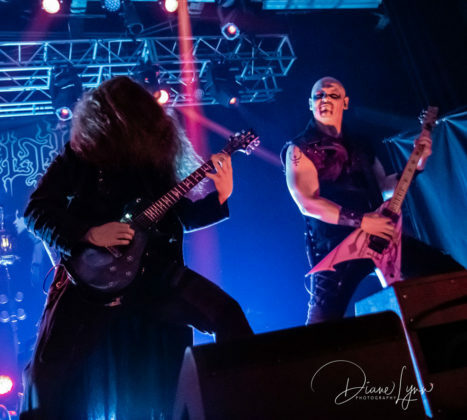 I’ve just learned that this year the band will be celebrating the 25th anniversary of the release of their debut album “The Principal of Evil Made Flesh”. 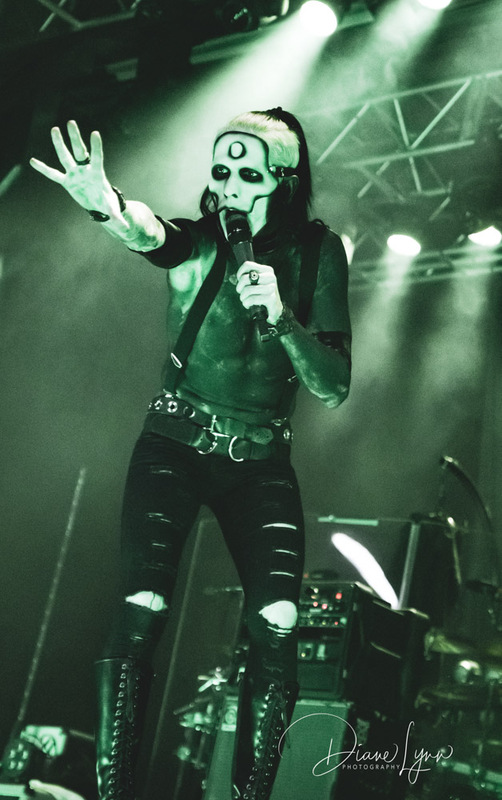 I applaud them for the longevity and success as there are not a lot of bands of any genre that are still out there touring (around the world) and still drawing in the crowds. 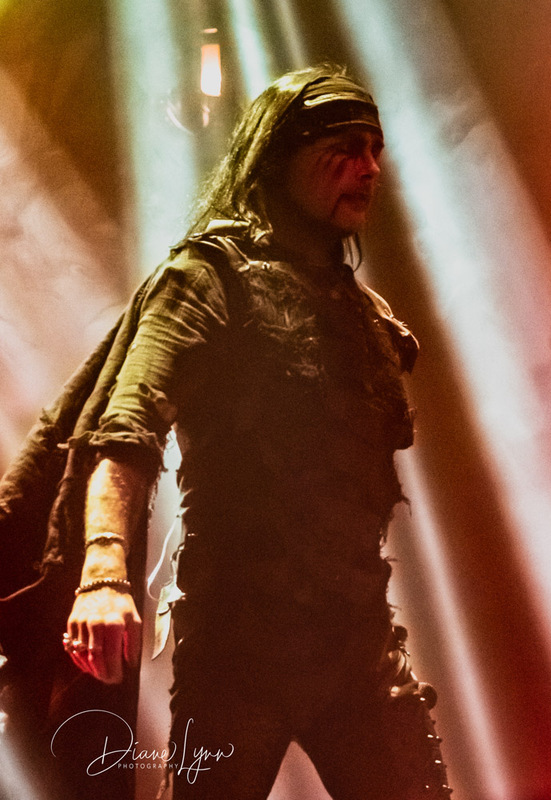 Although there have been a few changes in the line up over the years this is a band Dani Filth continues to lead in the right direction and I’m sure we’ll be seeing Cradle of Filth touring for many more years to come. 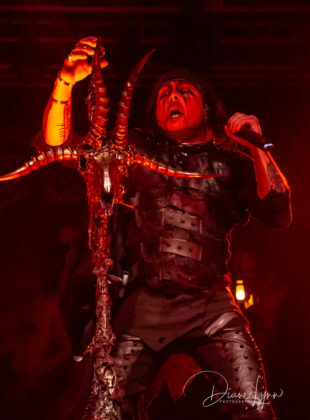 As I talk about theatrics and choreographed moves I have to add that the show did not lack in good old fashion metal goodness. 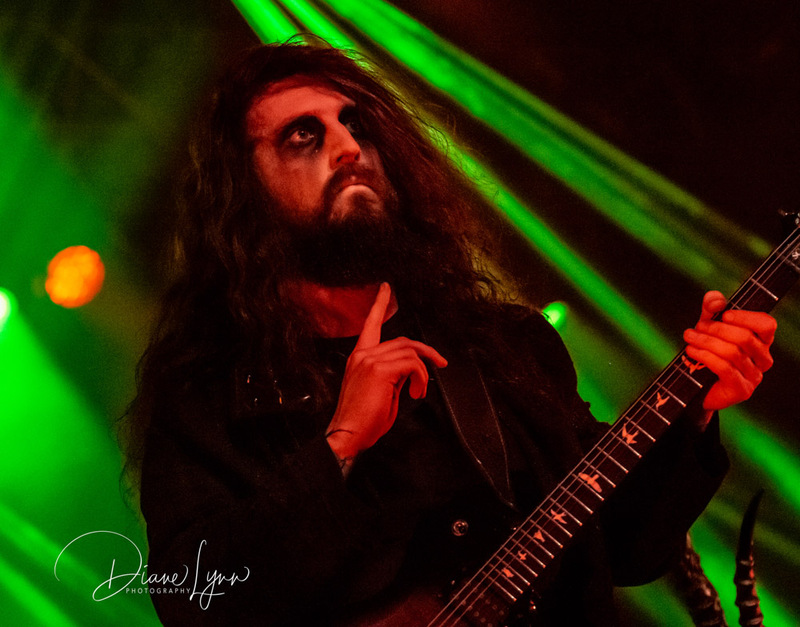 The fast riffs and screaming guitars of Richard Shaw and Marek ‘Ashok’ Šmerda…the deep, precise bass licks of Daniel Firth…the rhythmic keys of the oh so lovely Lindsay Schoolcraft and the HEAVY drum beats of Martin ‘Marthus’ Škaroupka. I wish they had showcased the drums a bit more, he was definitely bringing the sound all together to fill our ears with rich Gothic Goodness! 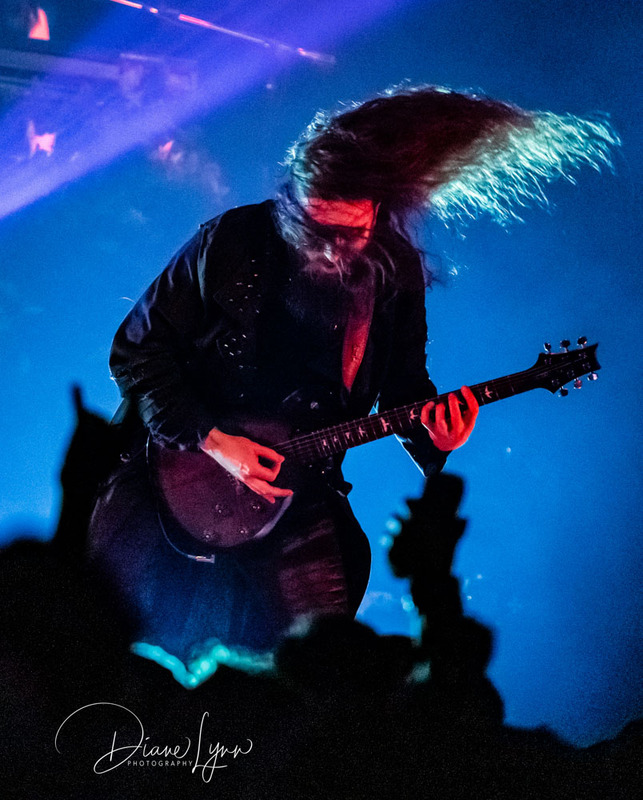 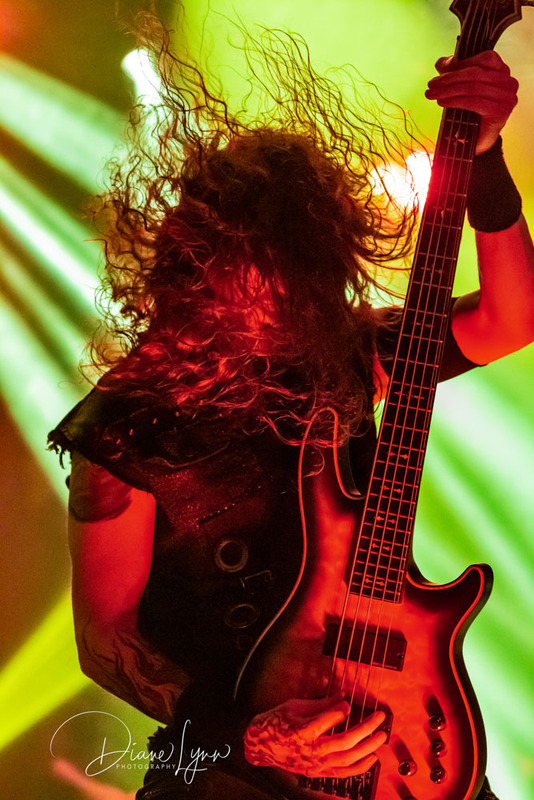 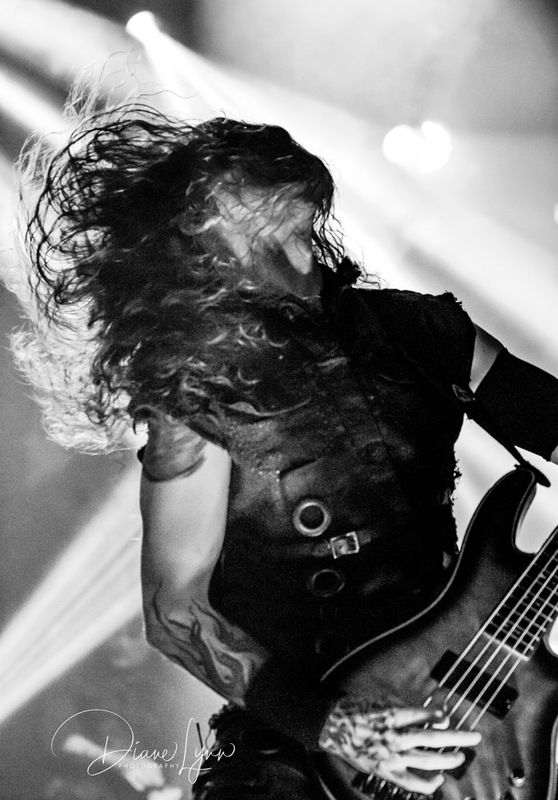 The headbanging was plentiful with the long hair spun in circles that only true metal fans can appreciate! 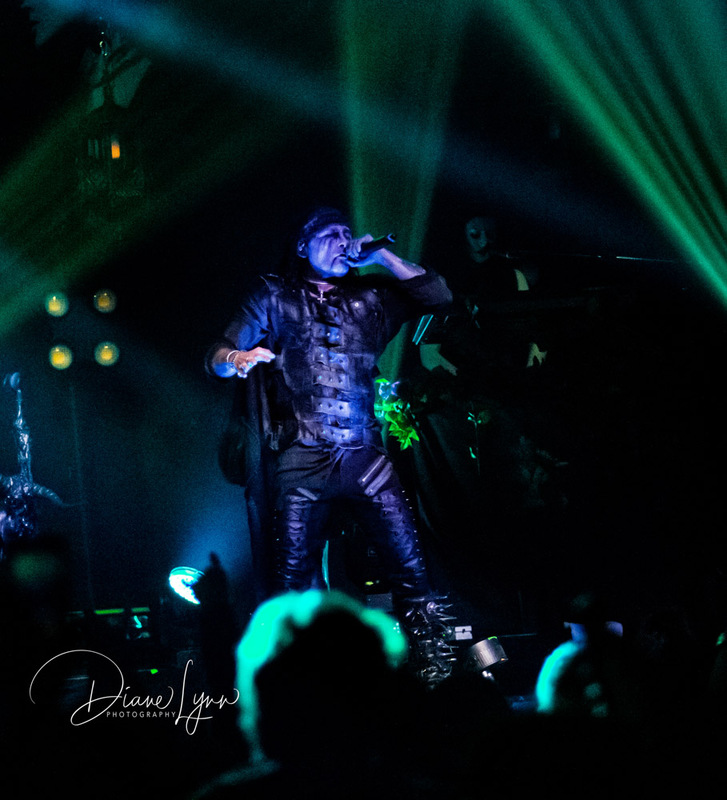 Although Cradle of Filth is touring for the Cryptoriana – The Seductiveness of Decay album they will soon be dropping a new one. 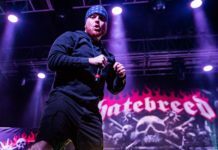 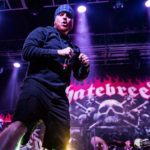 Even with no title yet released for their thirteenth album it’s still getting some buzz among the fans. 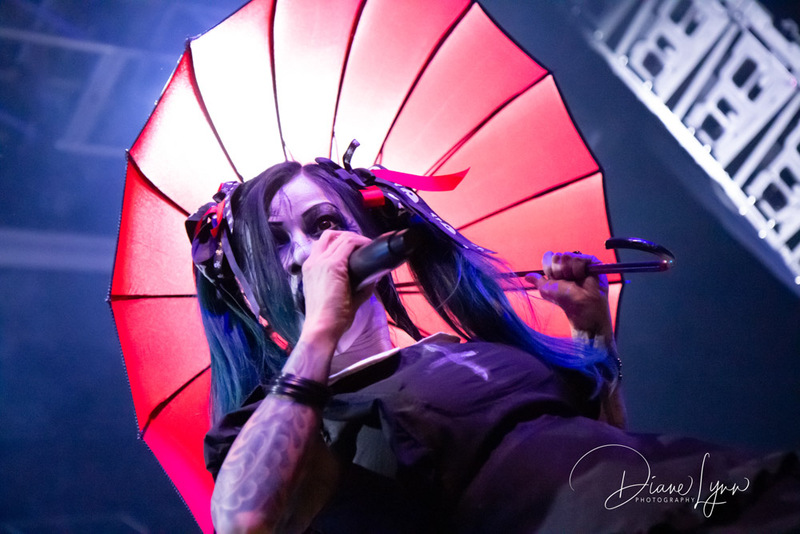 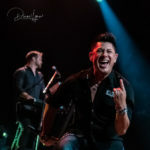 Speaking of the fans, they are a very dedicated group, as I walked through the crowd after shooting the first three songs, I took notice that each and every one of them were singing the lyrics with vigor as if the songs were anthems. 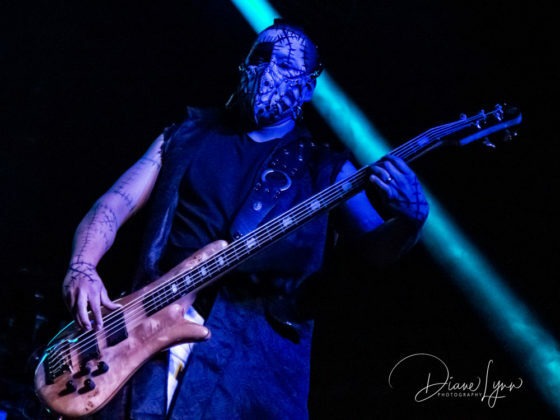 A few of the very dedicated wore full costumes to the show and they were just as elaborate as those worn by CoF on stage. 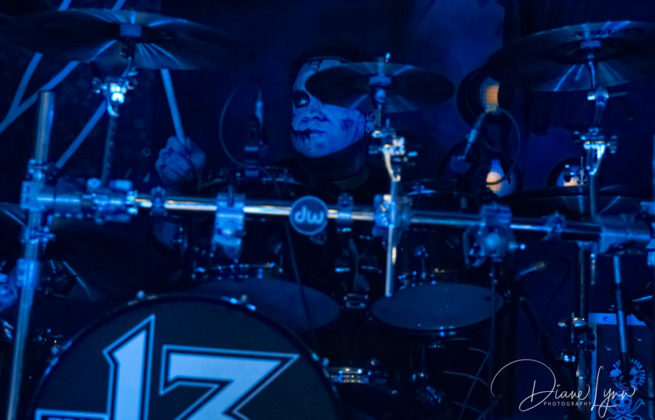 That is true loyalty and pure dedication to your band! 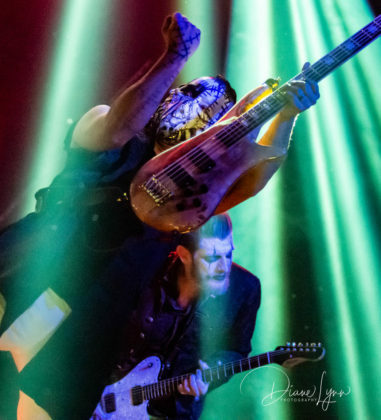 Soon after the American leg of this tour is over the band heads back out of the county to do some Europe dates then, around the start of May they are heading down to Mexico, Brazil and Ecuador to name a few, then over to Russia and then back to the UK! 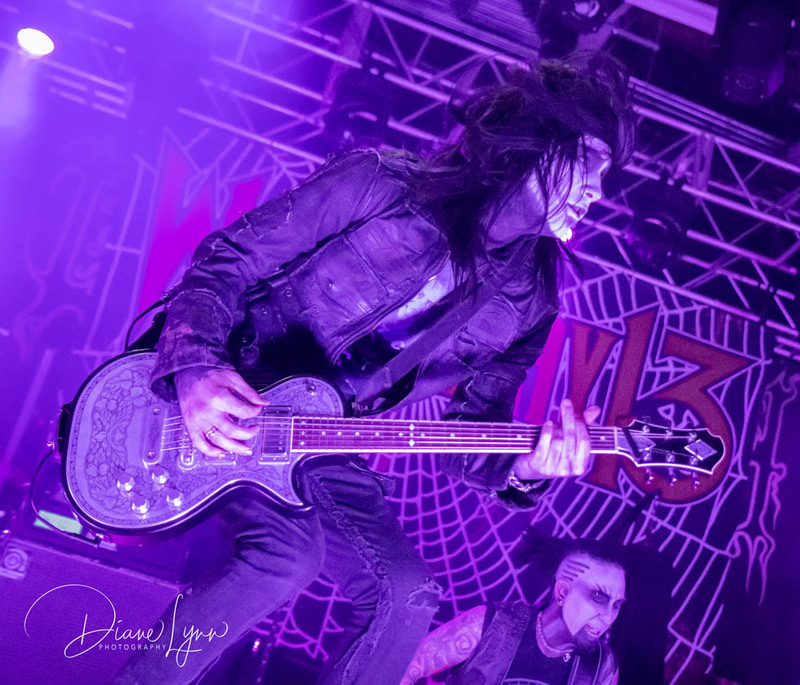 The direct opener for the night was a band I’ve been wanting to see for about a year now, Wednesday 13! 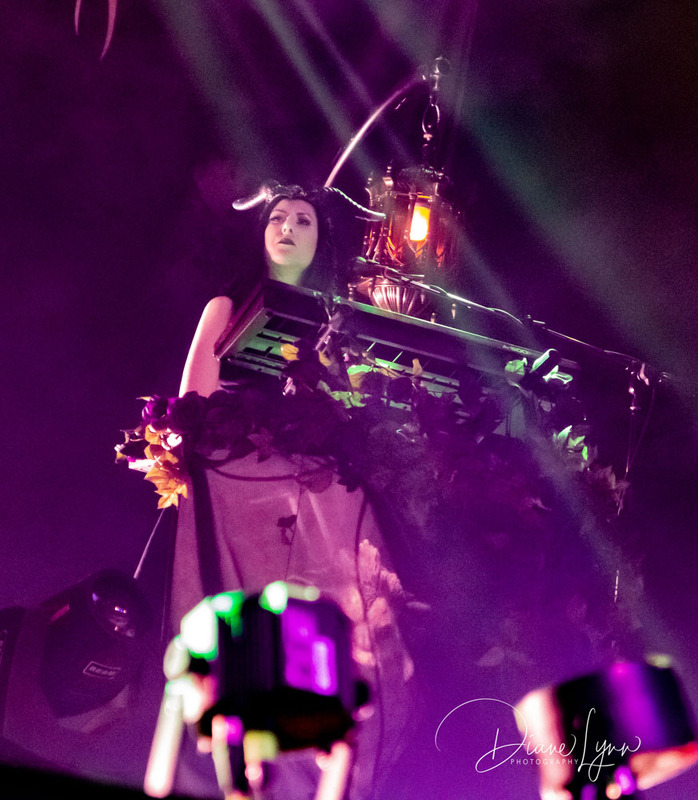 They were so much more than I ever expected! 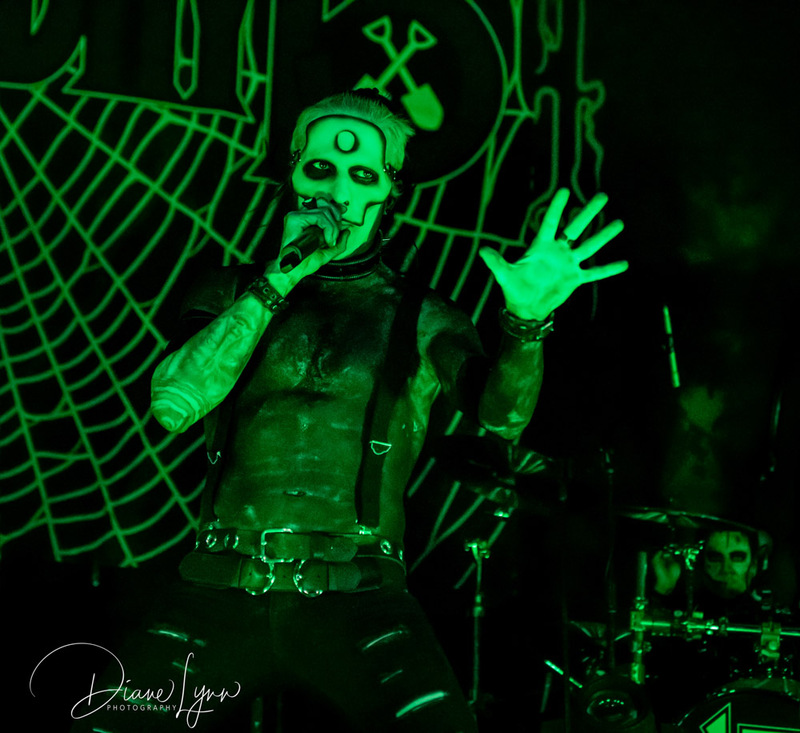 Another theatrical metal band that peaked my interest after seeing photos that a fellow photographer had shot. 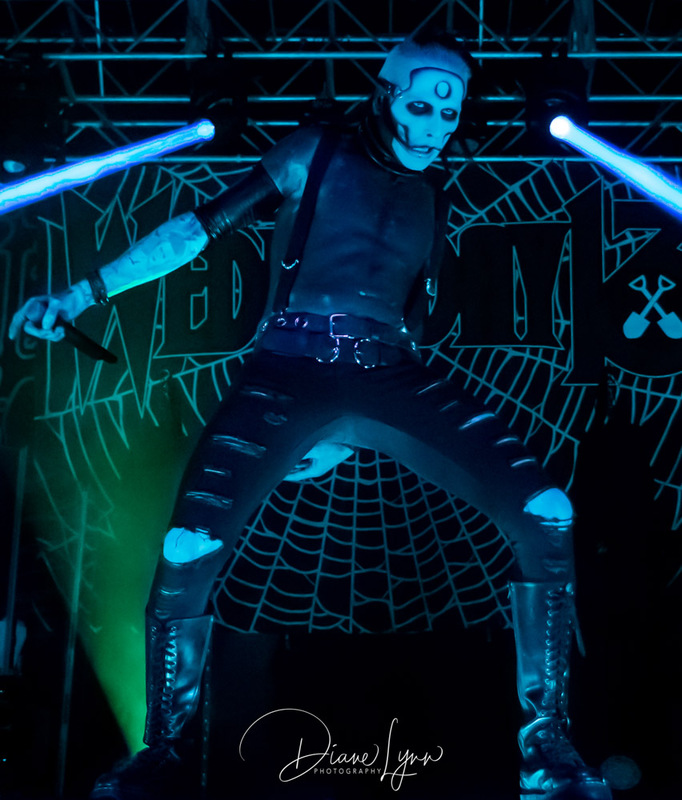 I was blown away by their stage presence and that was from just seeing show photos! Coming from a mostly Classic Rock background I’ve learned that inviting new types of music into my collection isn’t always a bad thing, in the case of Wednesday 13 it’s a great thing! After seeing and hearing them play live this past Friday I’ve already added their CD “Condolences” to my catalog and plan to add more! 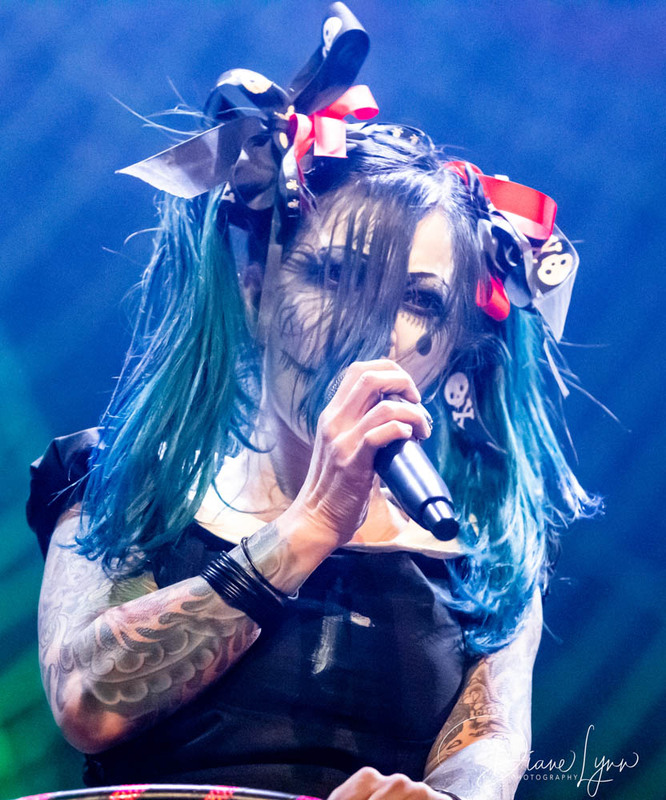 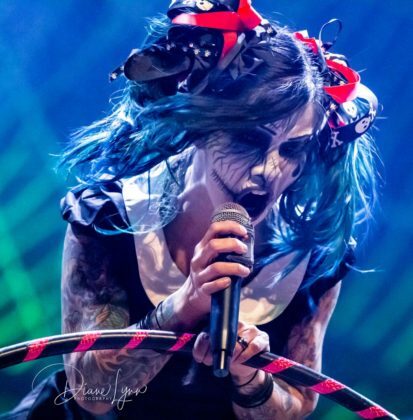 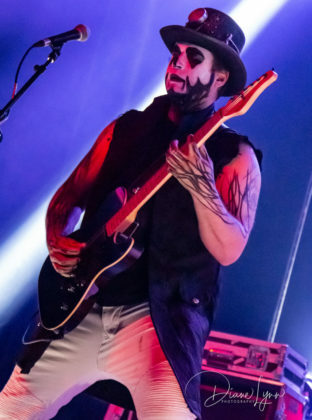 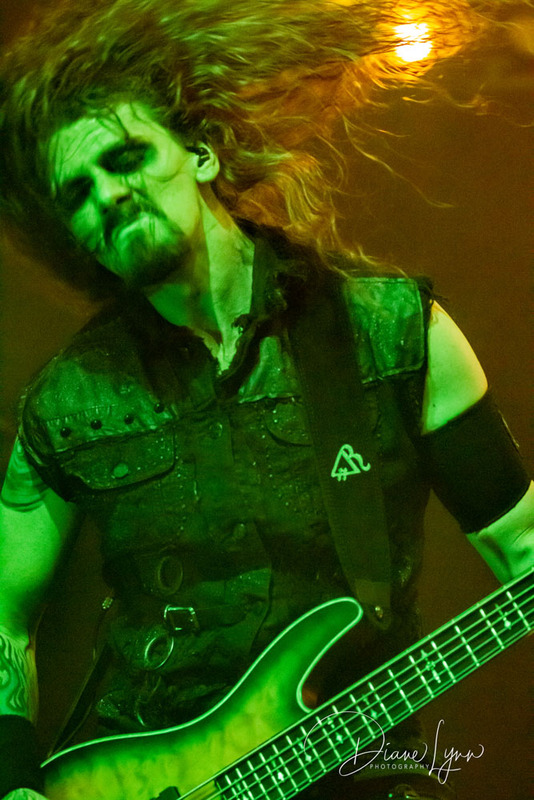 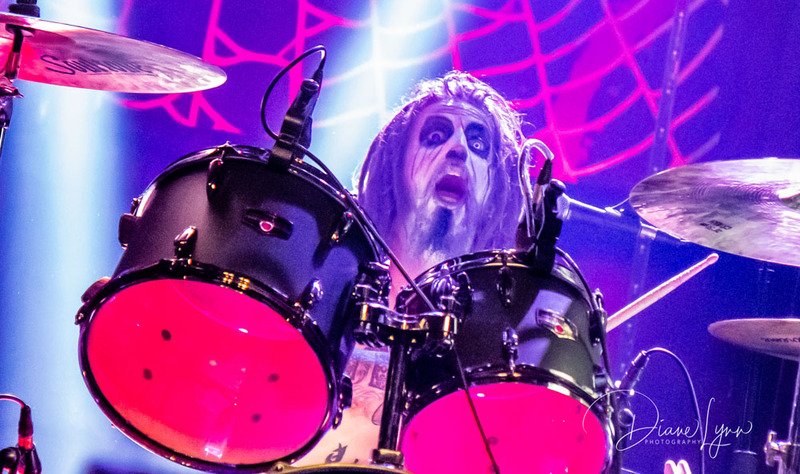 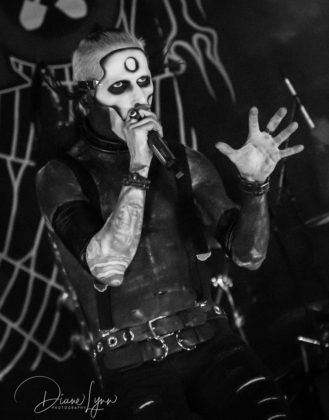 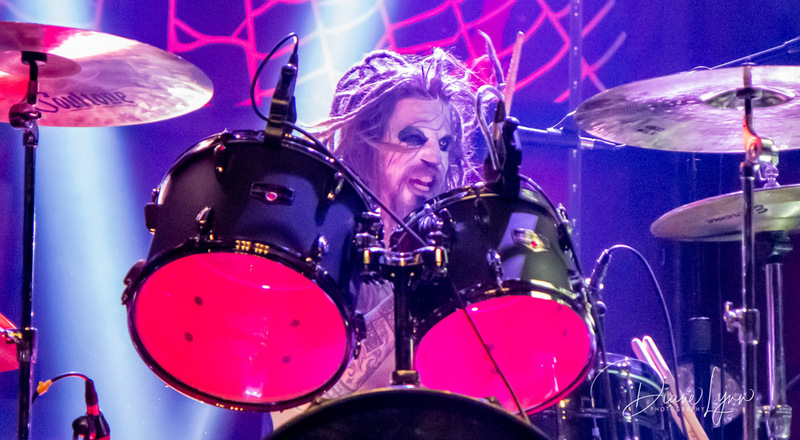 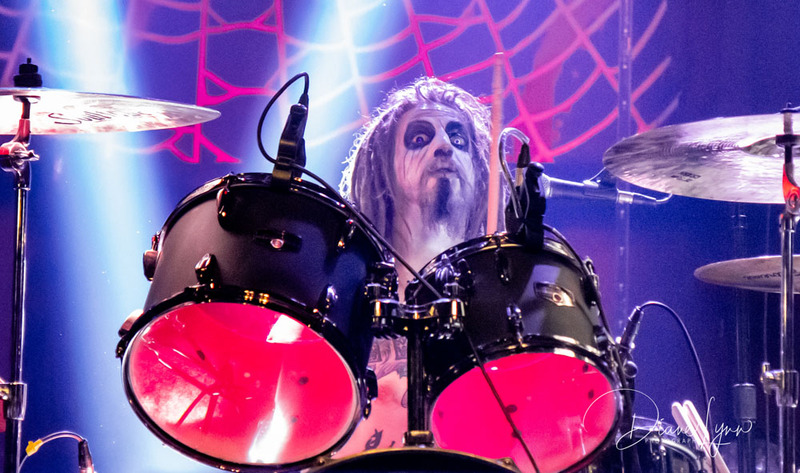 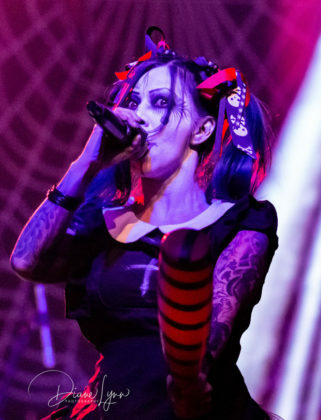 There’s something to be said for musicians in make-up, whether it’s goth, clown or just strange and peculiar. 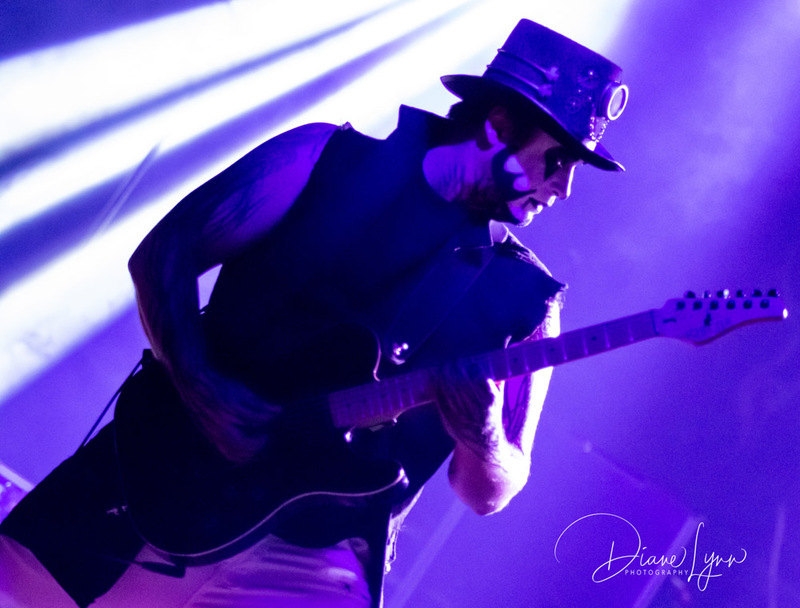 It grabs your attention and you instantly know you’re in for something more than just a rock concert. This group of musicians put on a solid, badass set. The masks and goth make-up complimented the killer music perfectly! The fantastic stage setting and choreographed moves added to the “frightening” performance. 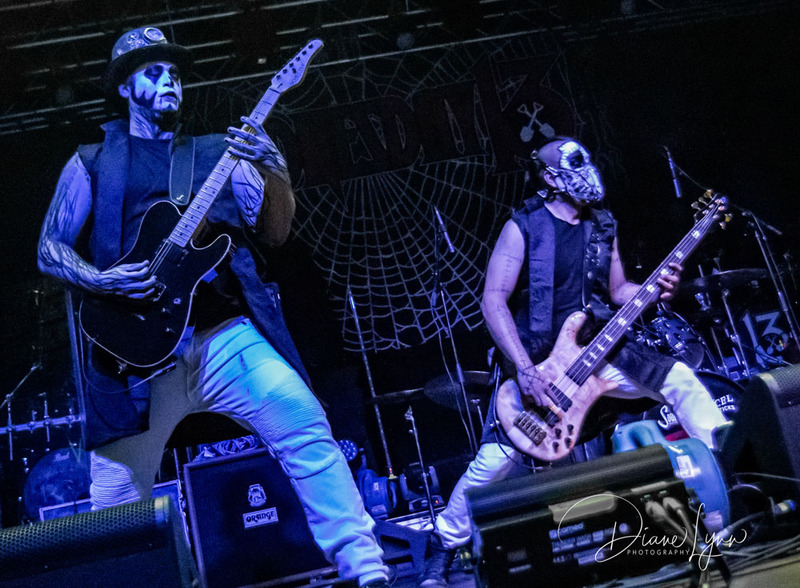 While the band made full use of the large stage as they performed their set with precise moves, they commanded your attention with their evil stares as they stopped occasionally to look over the audience as if they were eyeing their next victim. 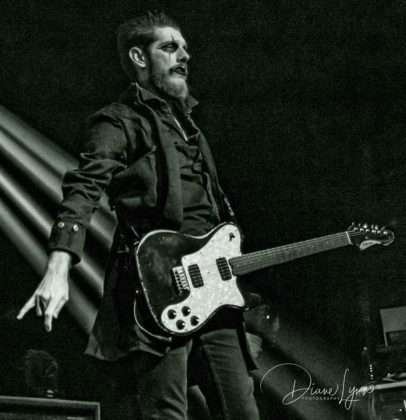 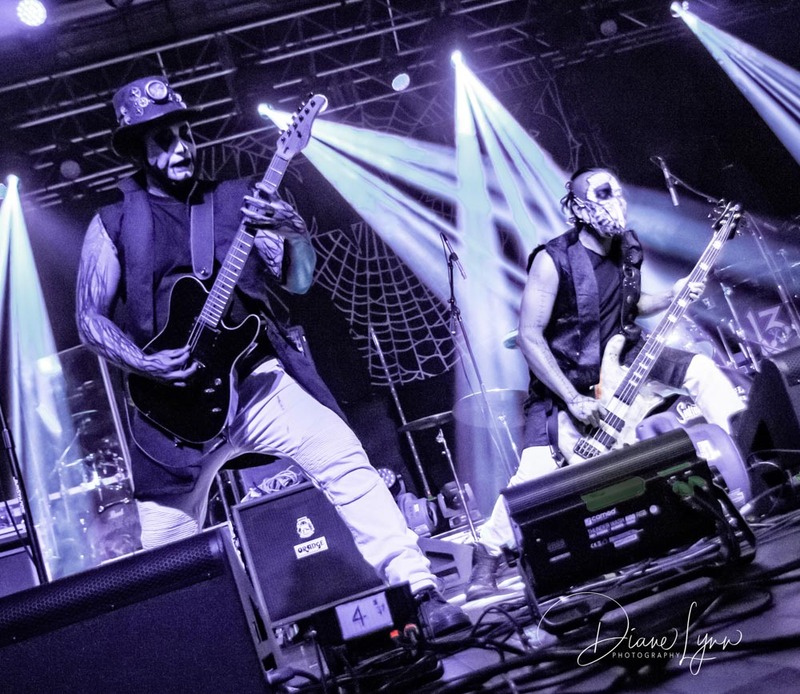 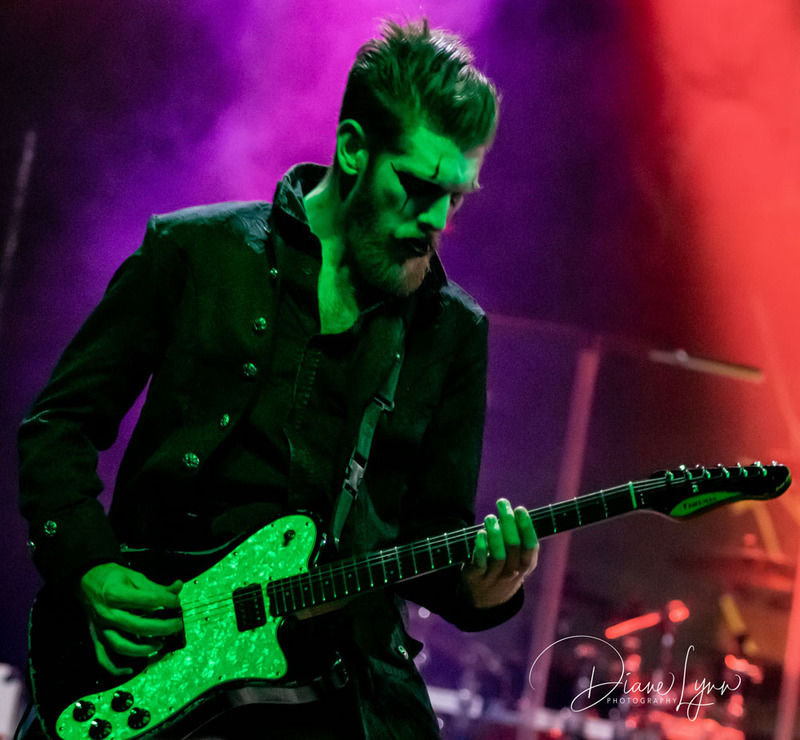 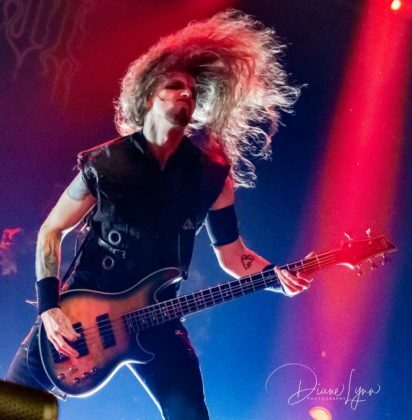 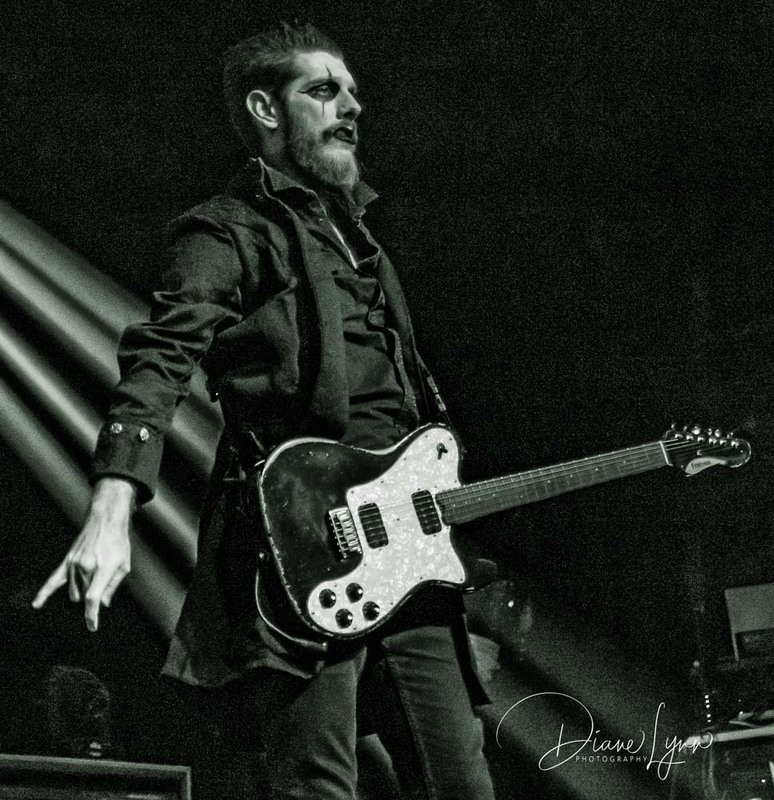 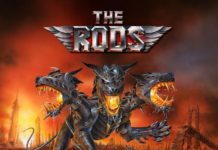 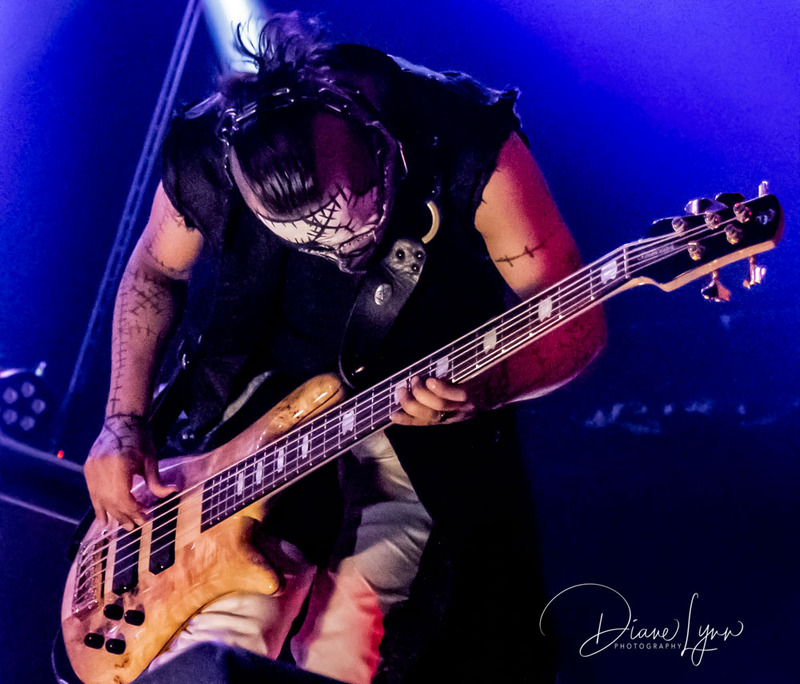 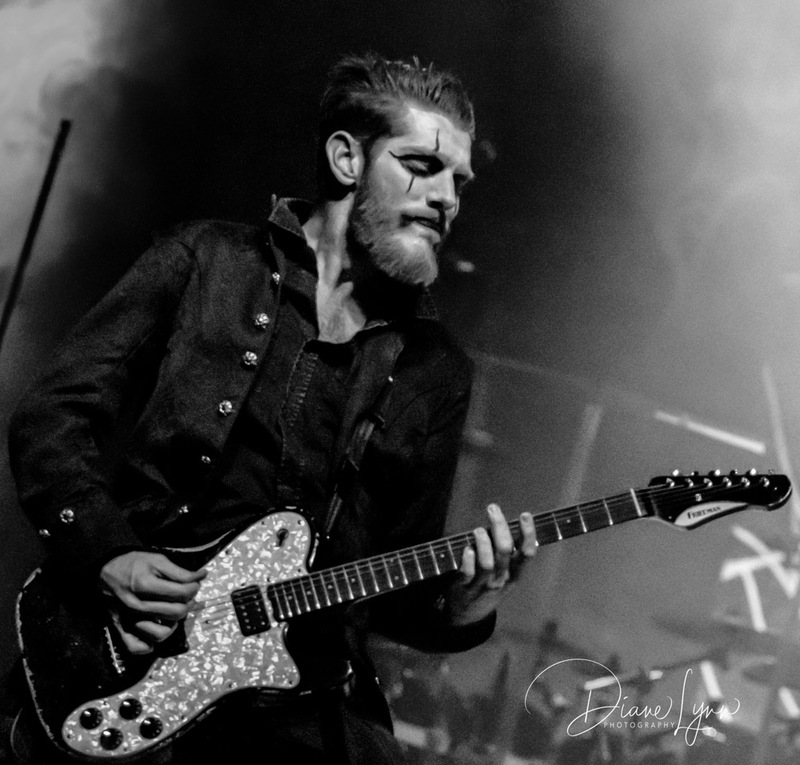 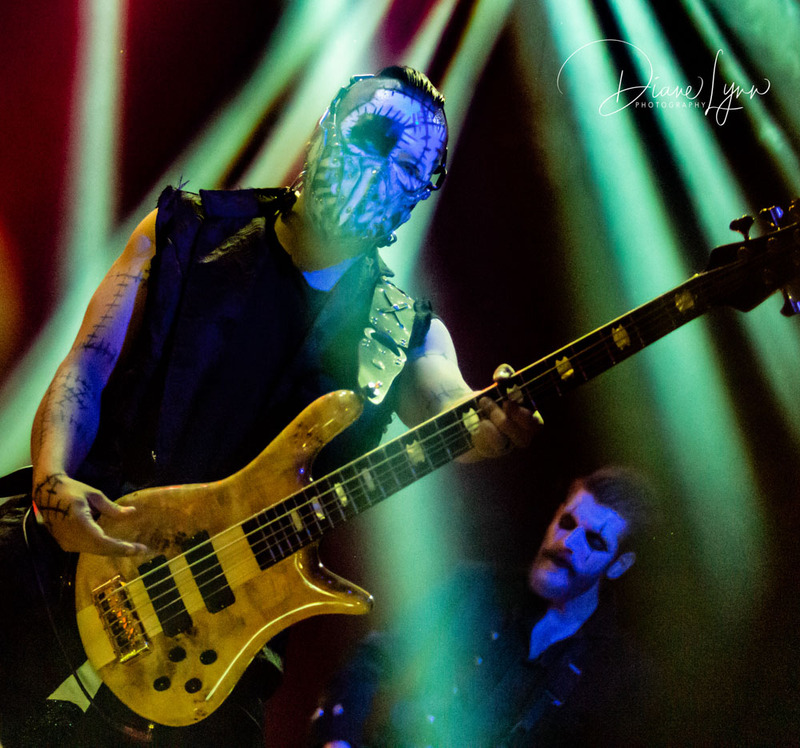 With Roman Surman and Jack Tankersly, on dual shredding guitars, Troy Doebbler proceeded to wear out the bass as Kyle Castronovo was hammering the drums, they used and abused those instruments for our sheer delight! 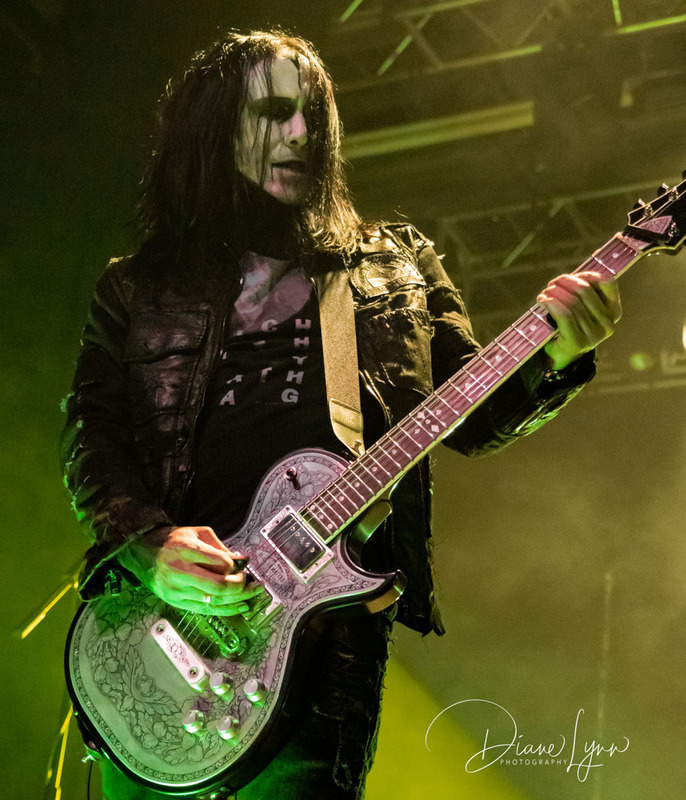 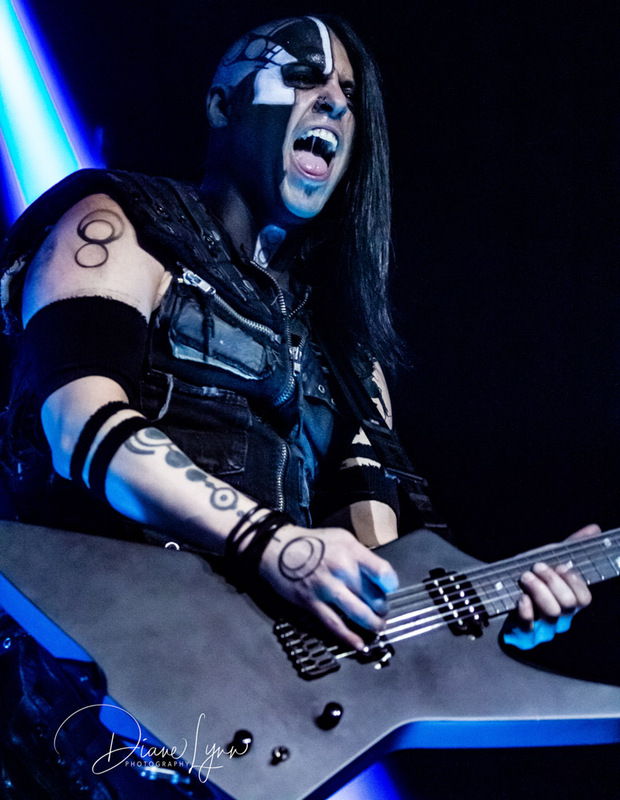 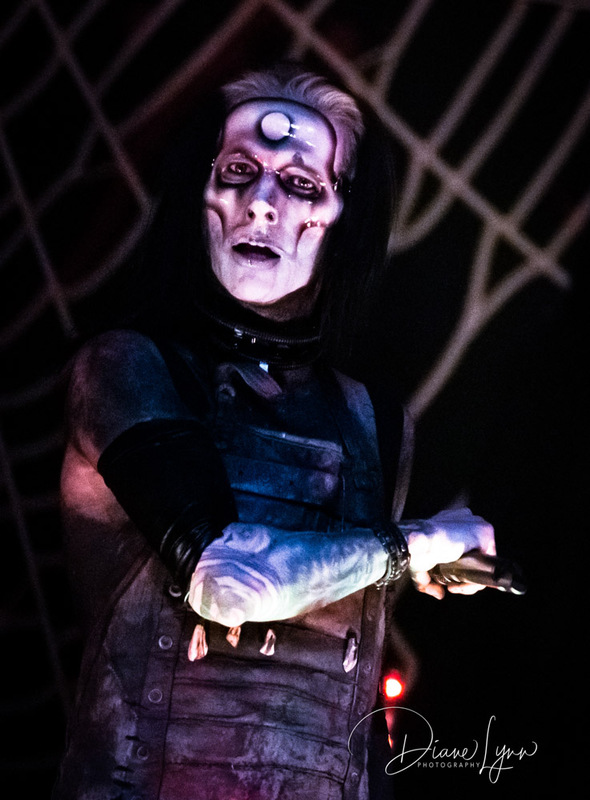 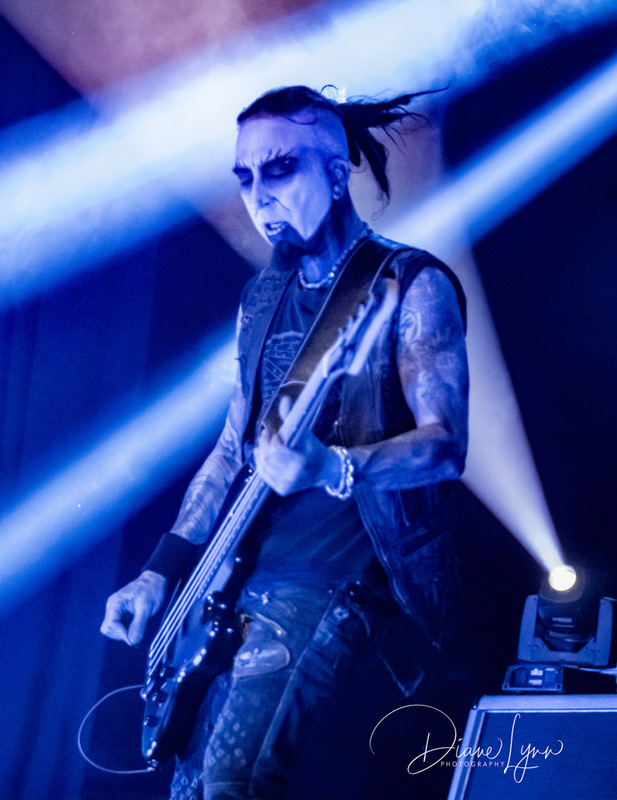 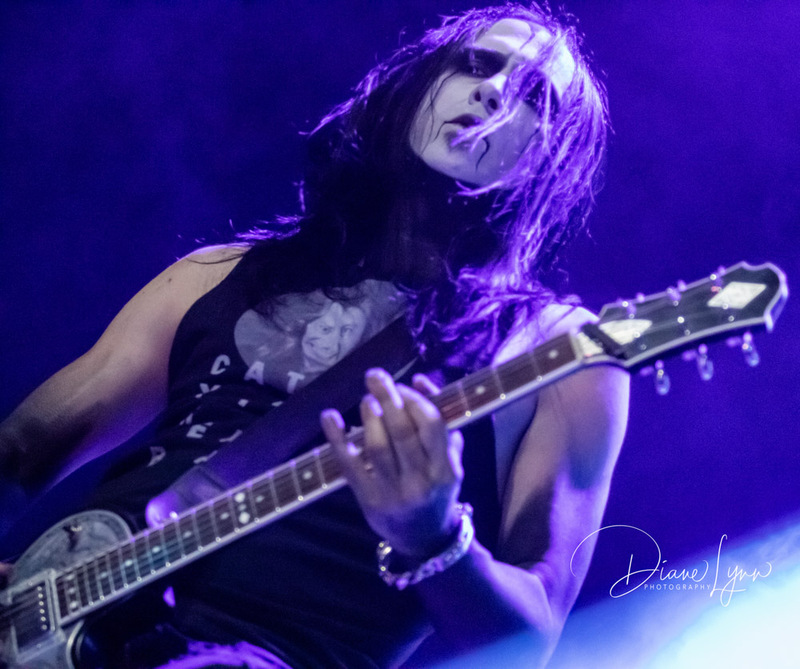 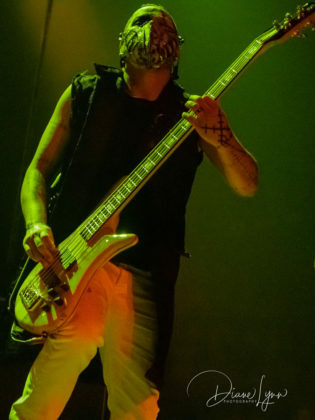 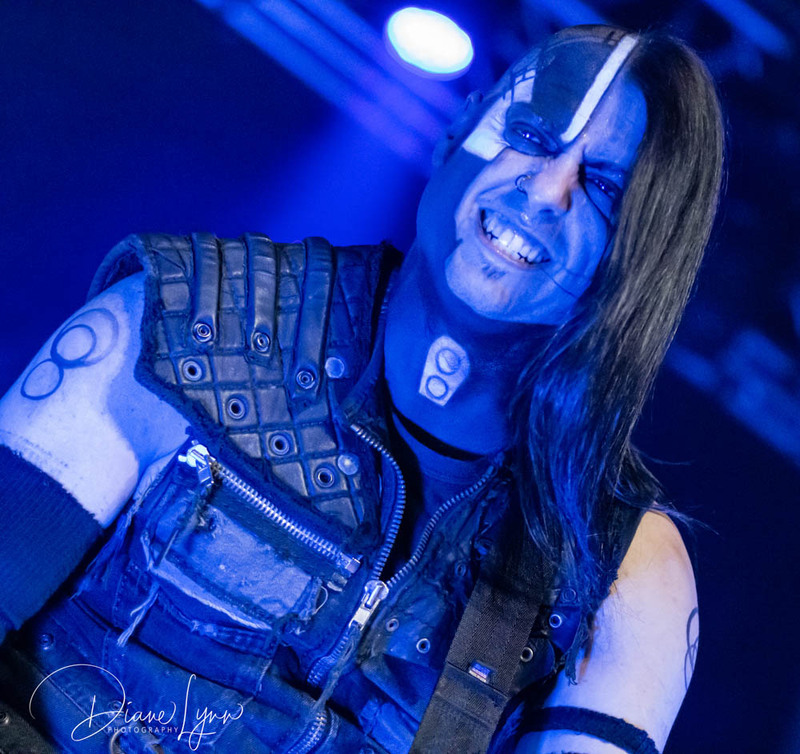 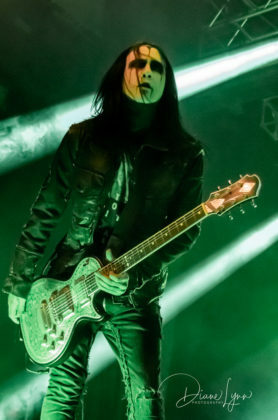 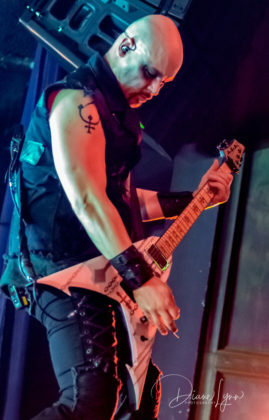 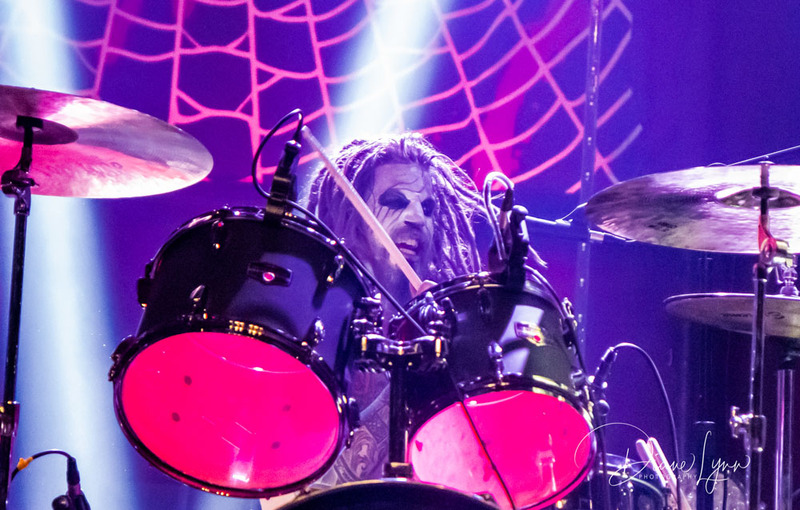 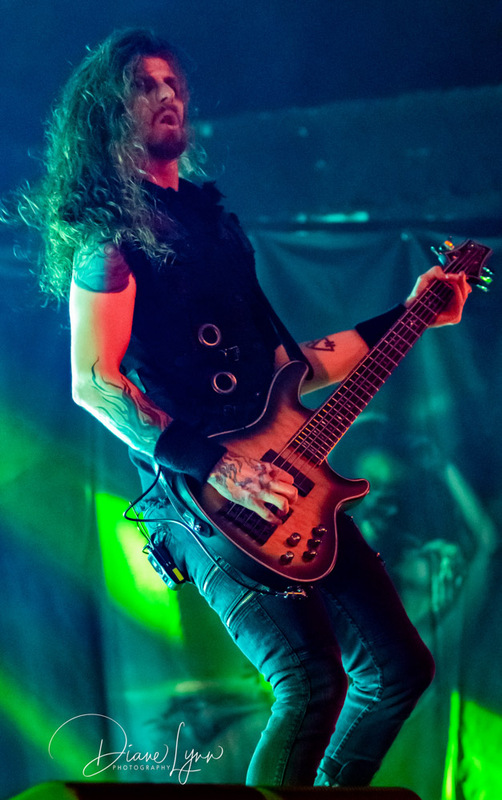 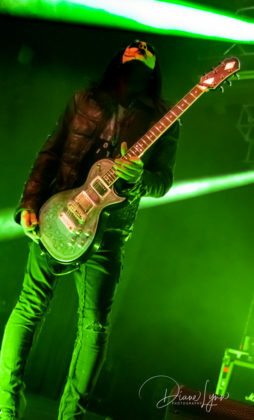 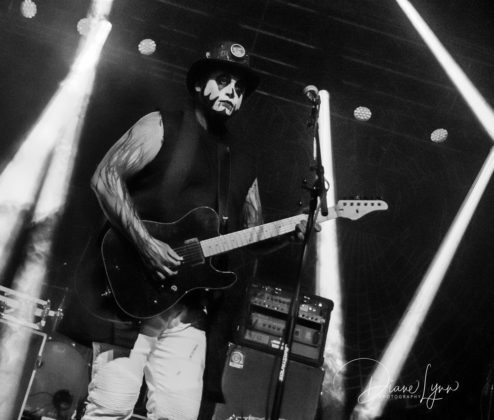 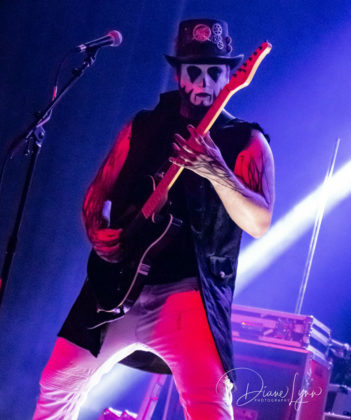 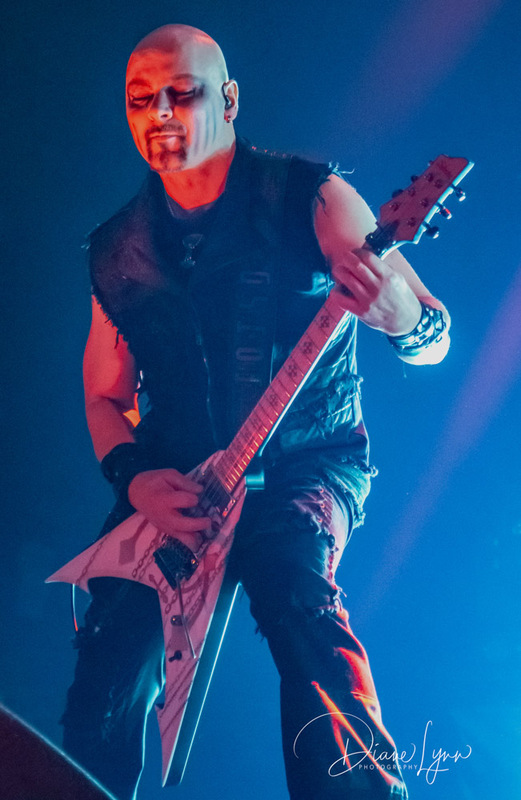 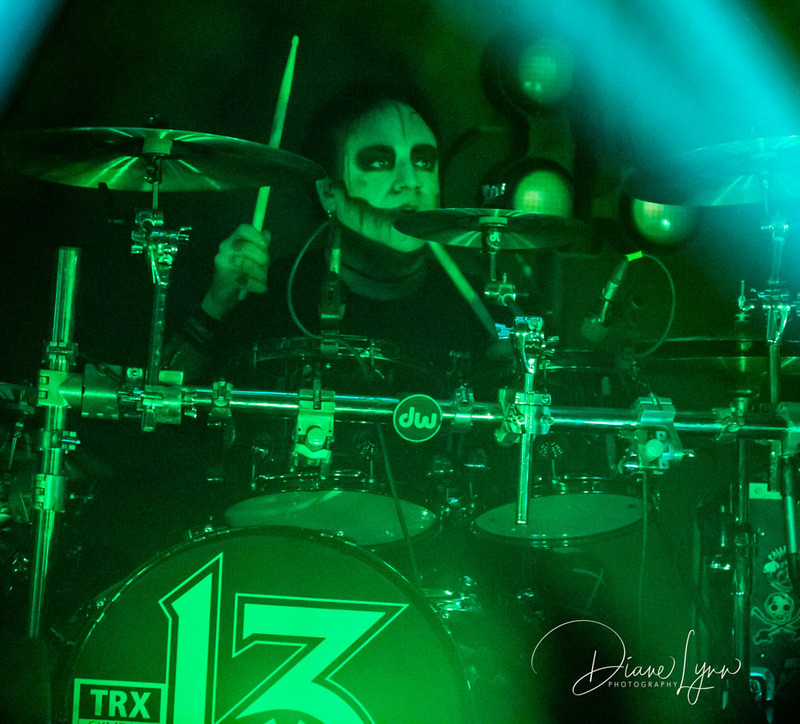 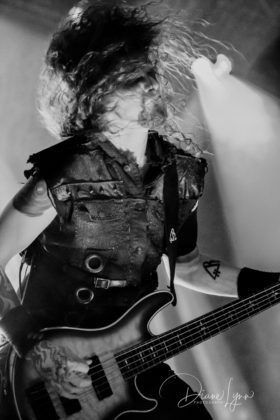 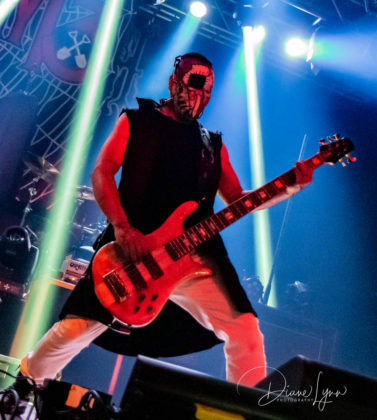 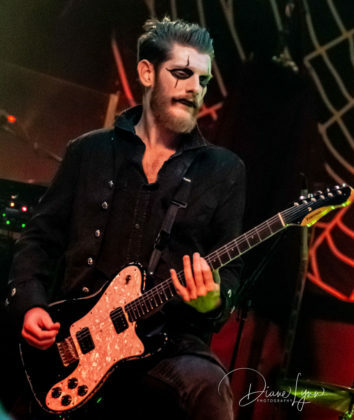 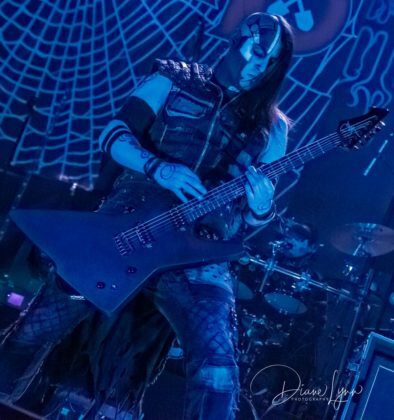 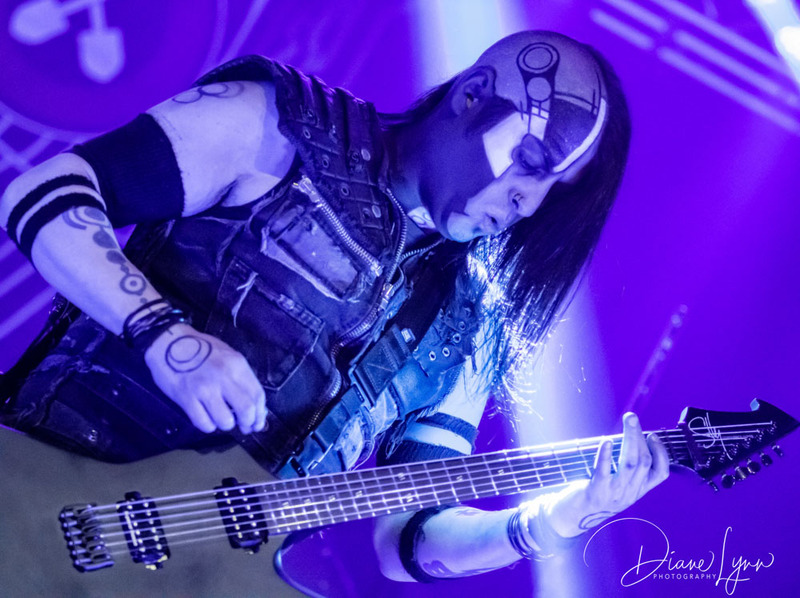 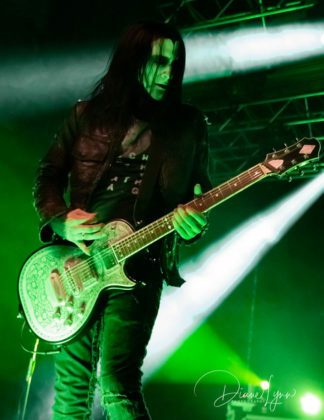 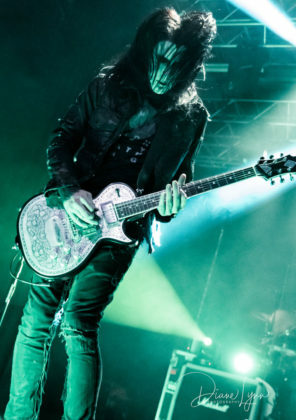 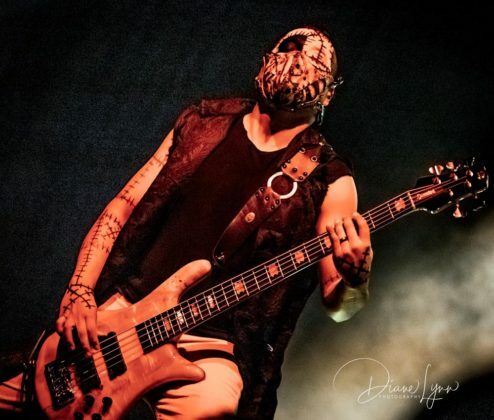 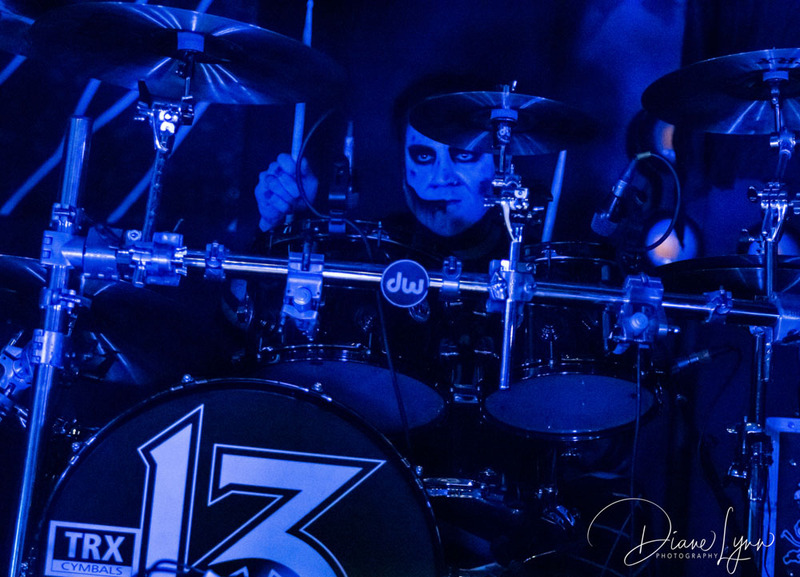 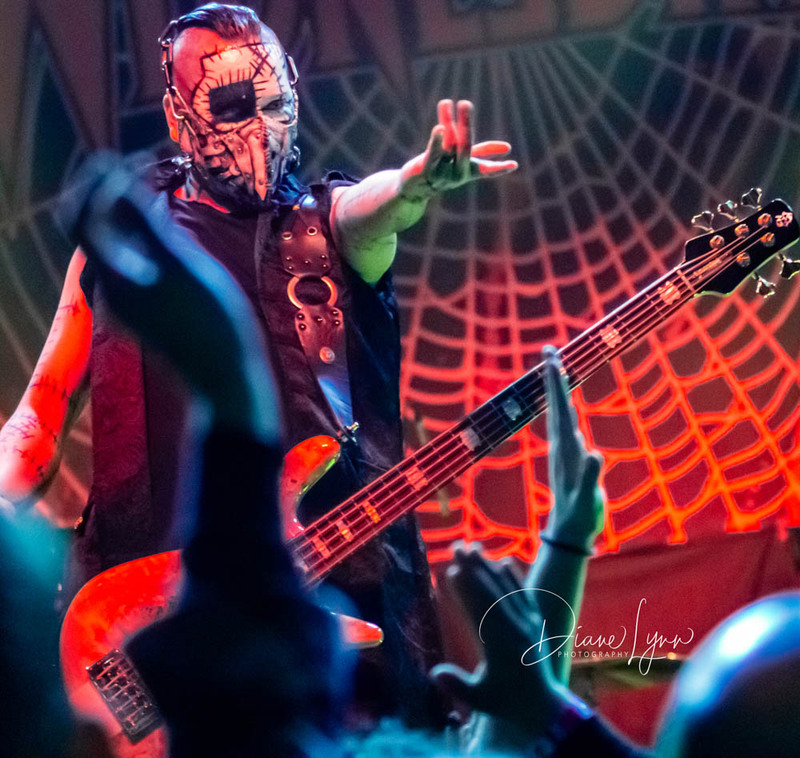 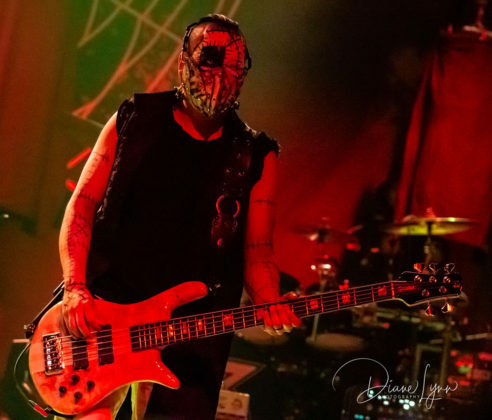 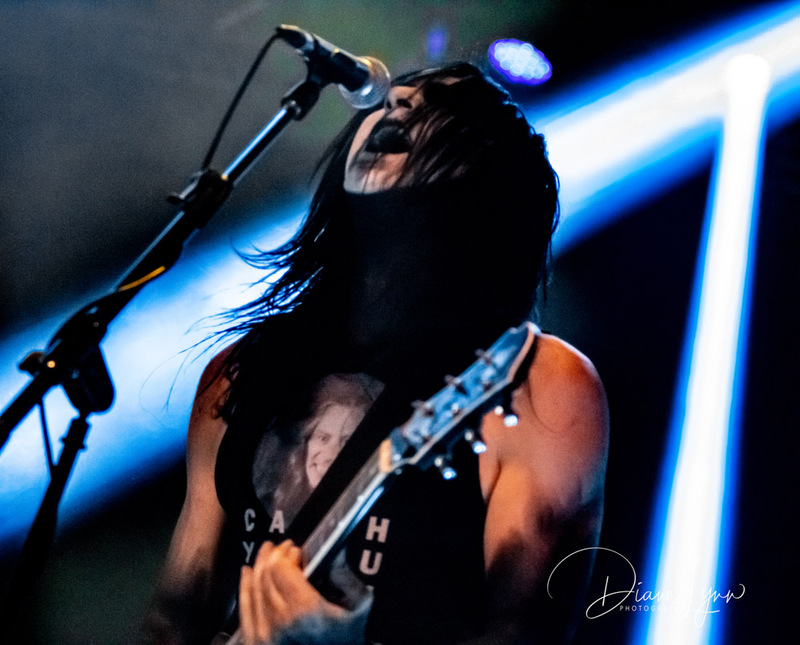 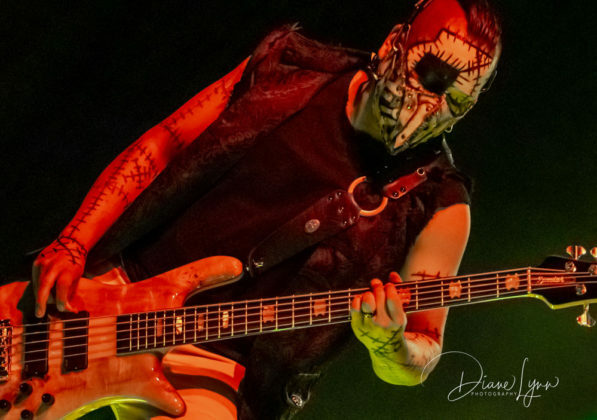 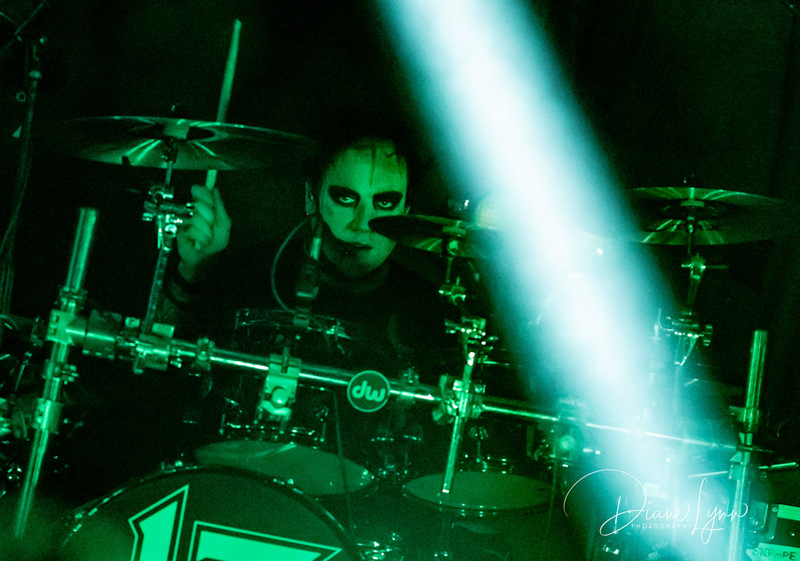 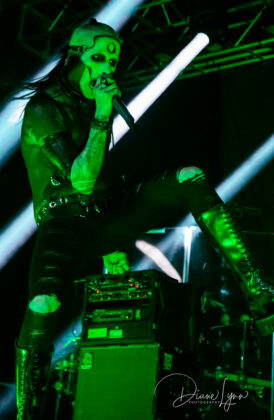 The front man for Wednesday 13 (the Duke of Spook) has a list of righteous credits behind him such as Murderdolls, The Rejects and Frankenstein Drag Queens. 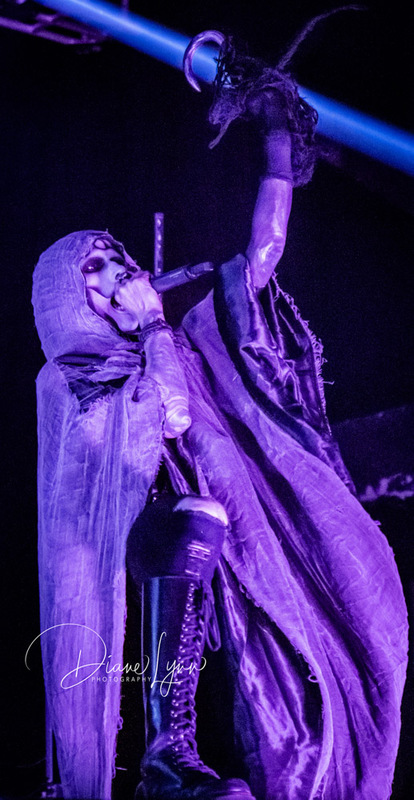 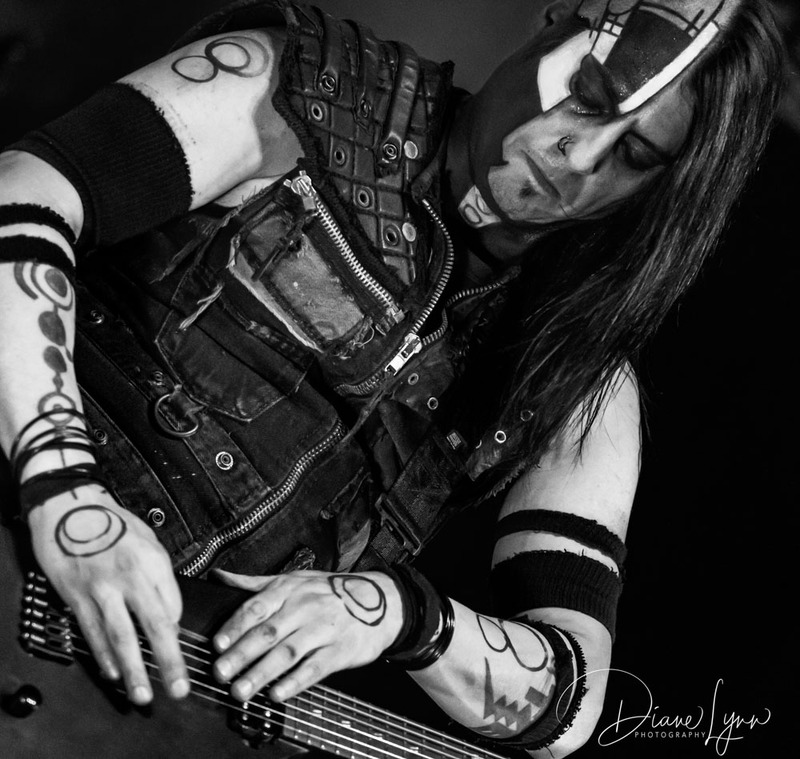 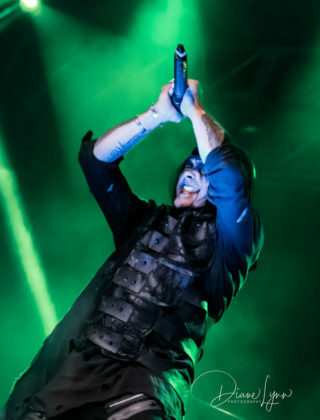 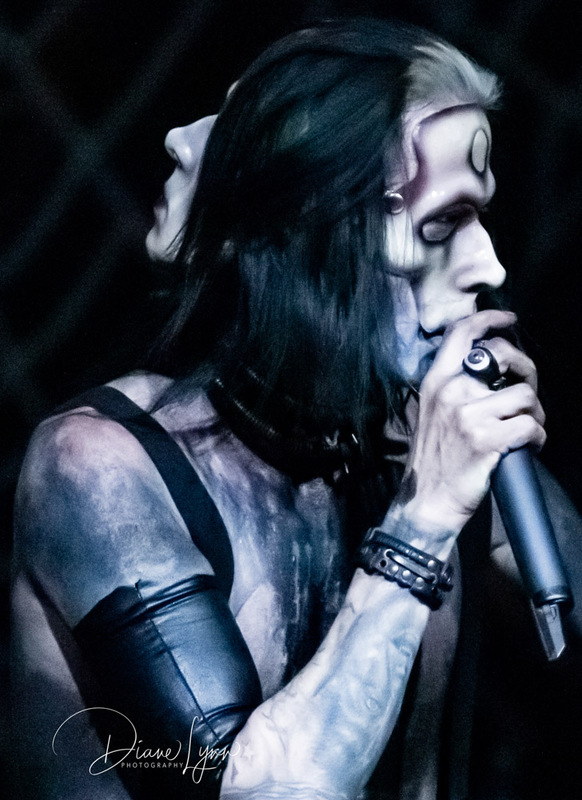 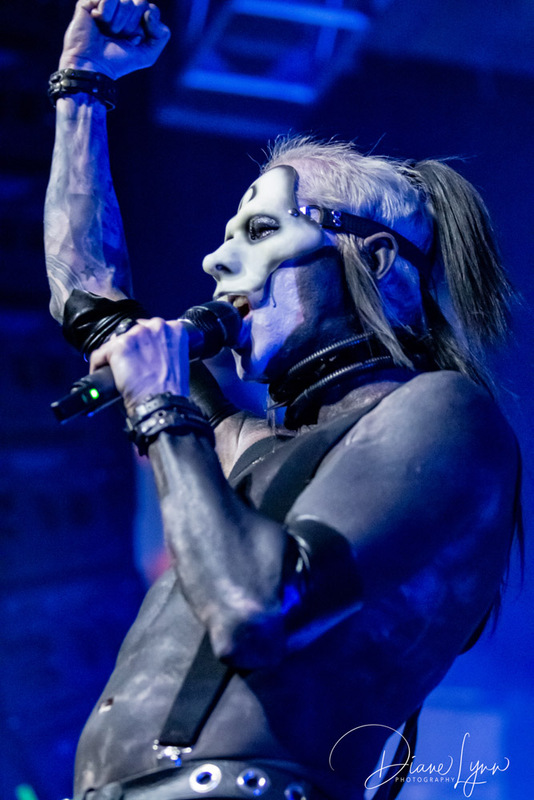 Joseph Poole is listed only as “Wednesday 13 – lead vocals” on their Facebook page. 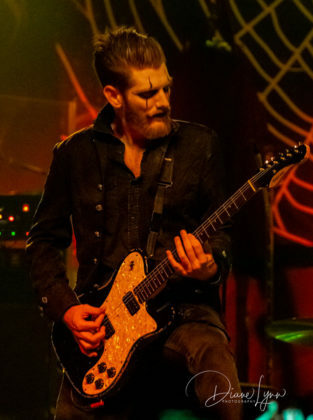 Yes, the band is named after him or is he named after the band? 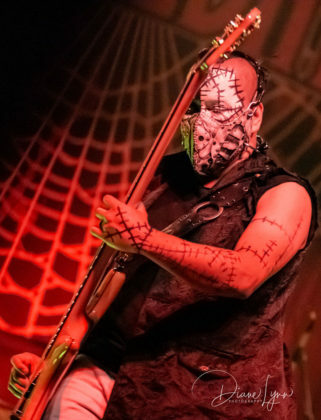 But he’s also under @MrMotherFucker13 on Instagram, so there’s always that! 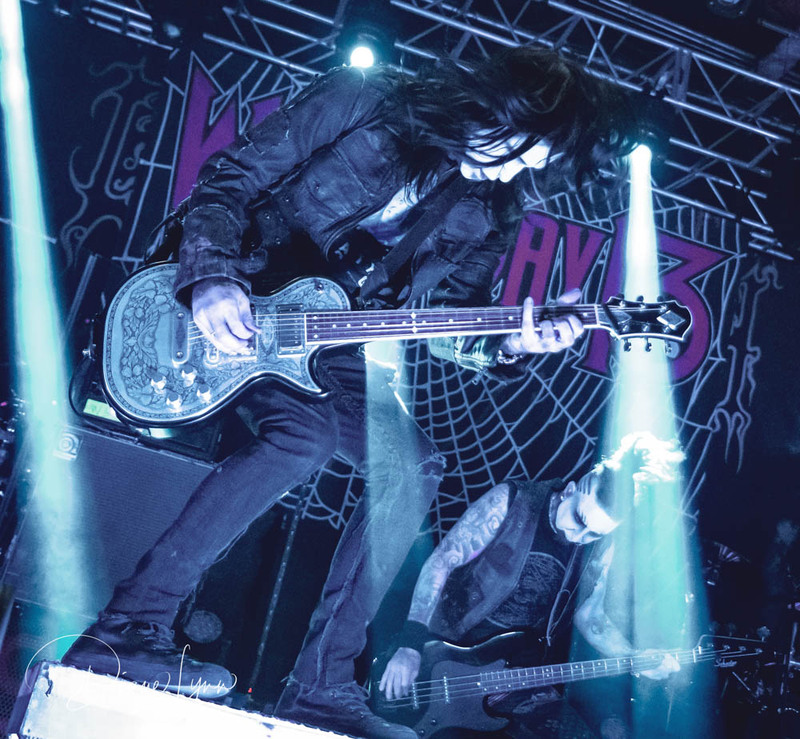 I’d love to see Wednesday 13 again and again! 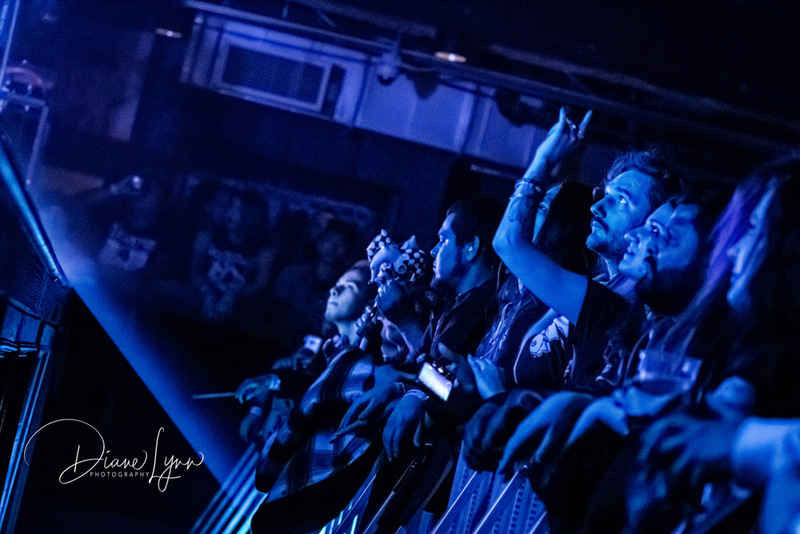 The fans were feeling the same this past Friday! 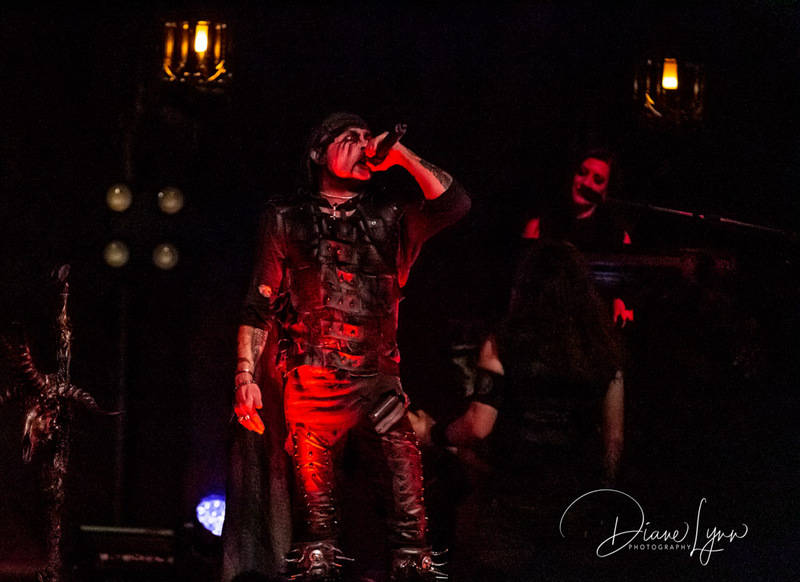 Wednesday 13 was the perfect pairing for Cradle of Filth, adding in opener Raven Black it was a full night of pure evil! 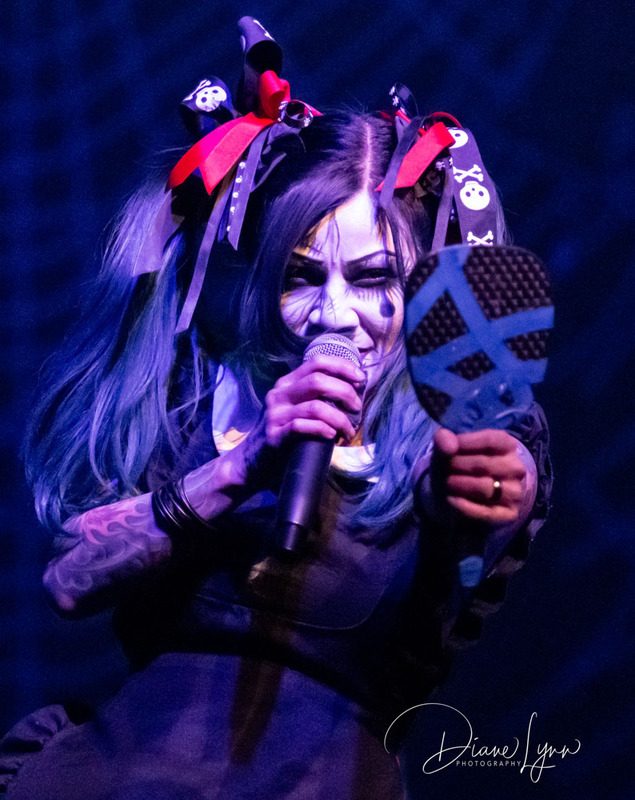 First on the stage was another total unknown to me, Raven Black! They were, however, not unknown to the mass of fans that came to see a full night of pure horror! 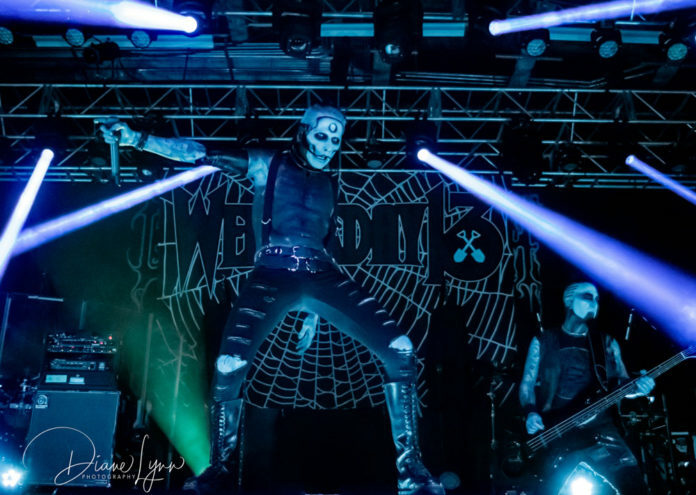 The lights dimmed and each band member took their spot-on stage. Everyone was ready but one was missing, where was the lead singer? 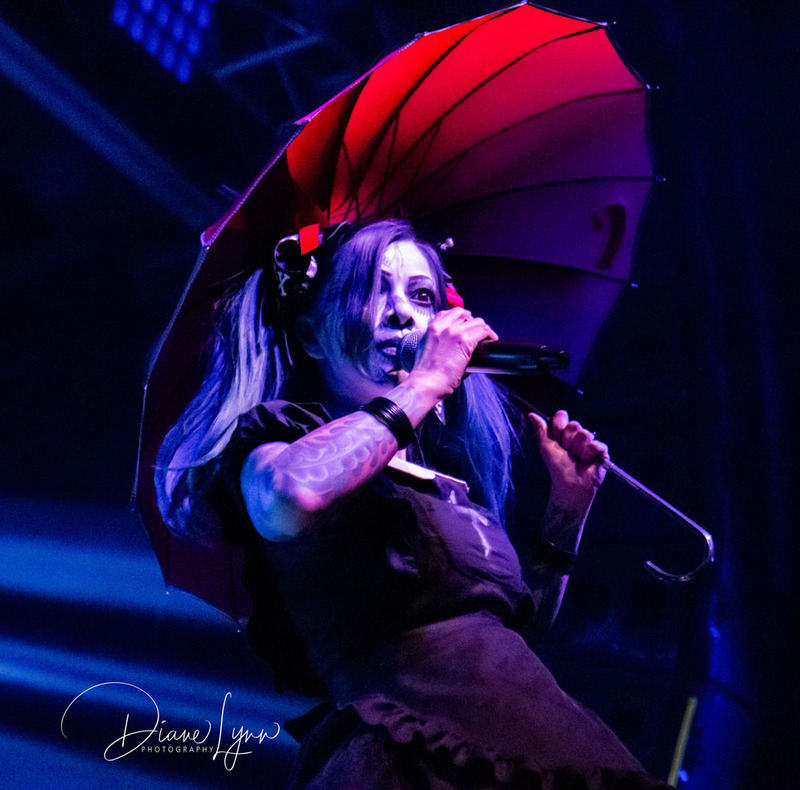 Suddenly she appeared, cute and petite in size, almost Doll like, wearing a fancy little black dress and carrying a bright red umbrella. Raven Black, the sweet innocent, evil doll-child that I immediately learned can unleash the bowels of hell on you all while having the cutest smile on her face that you’ve ever seen! This band grabbed me with originality. 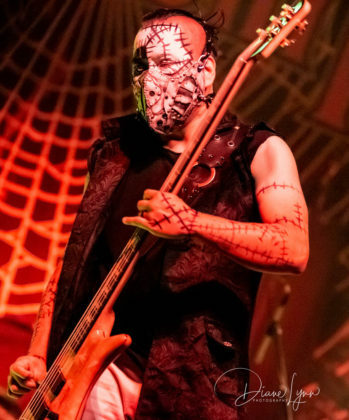 This was the start of what I call “metal theater fright-night” and they were the perfect choice to get things going! Performing songs such as their newest “Carnival”, “13”, “Doll House” and my favorite of the set “Twinkle, Twinkle Little Scar”. 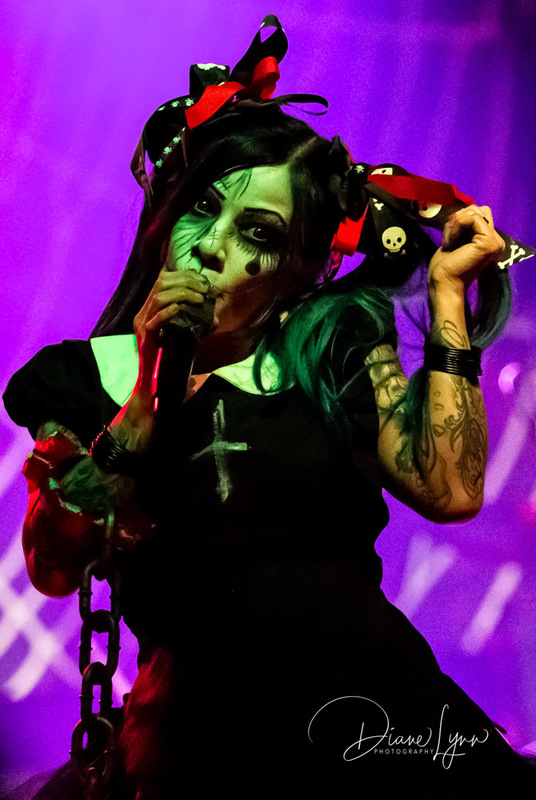 Although Raven Black may be petite in size that is not the case for the powerful voice she projects. 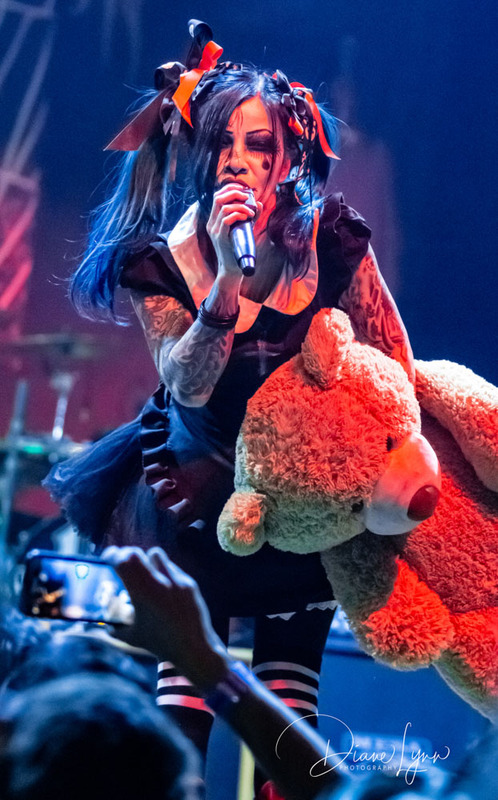 This talented doll grabs your ears with her voice and fills your head with the rhythmic lyrics of each song. Sharing the stage with Raven is The Doctor on lead guitar, The Demon Muppet on drums/vocals and Screams and Stitches on bass. 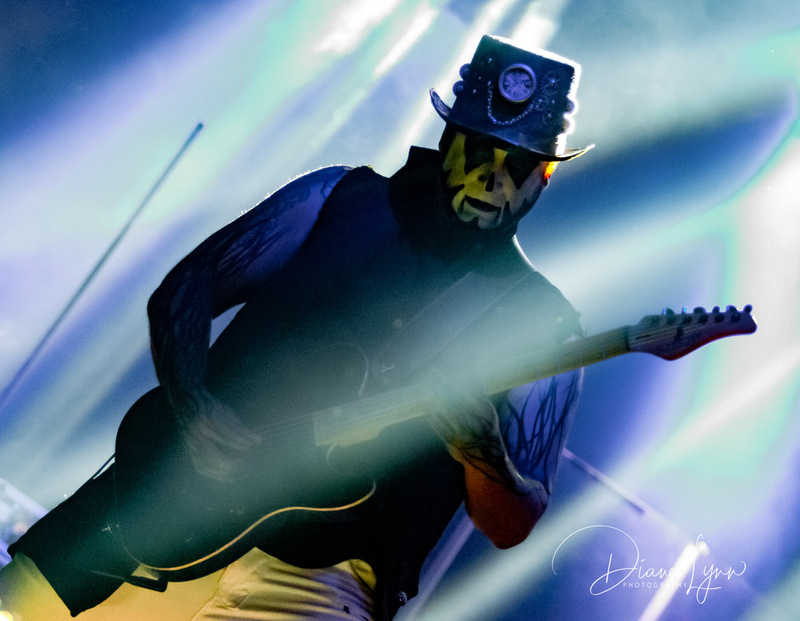 Included on stage was an additional guitarist (rhythm) but he is not currently not listed on their website or social media sights, but he rocked it hard with the rest of the cast! 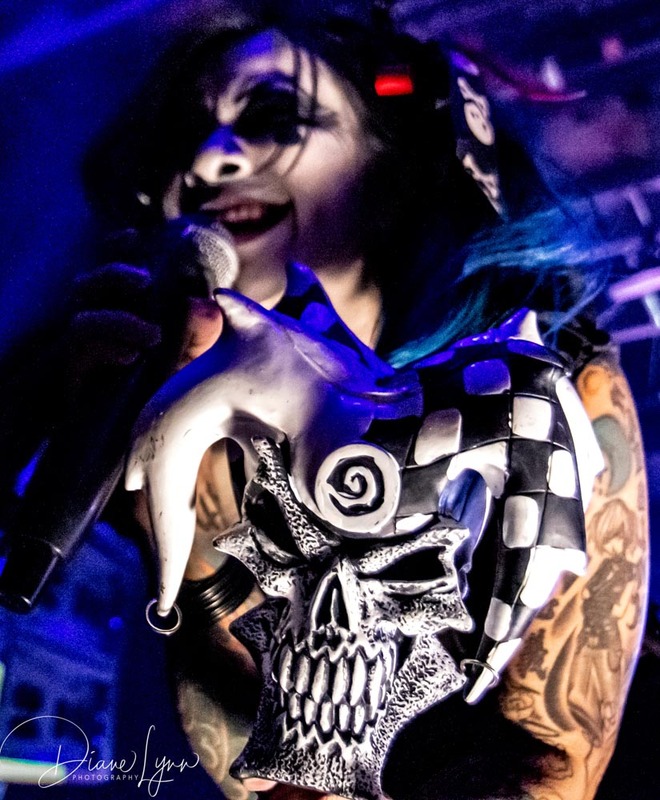 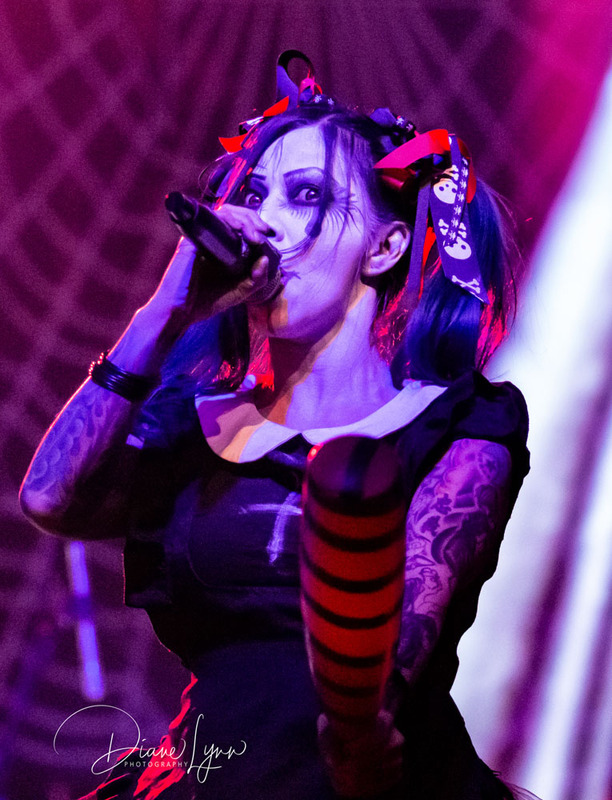 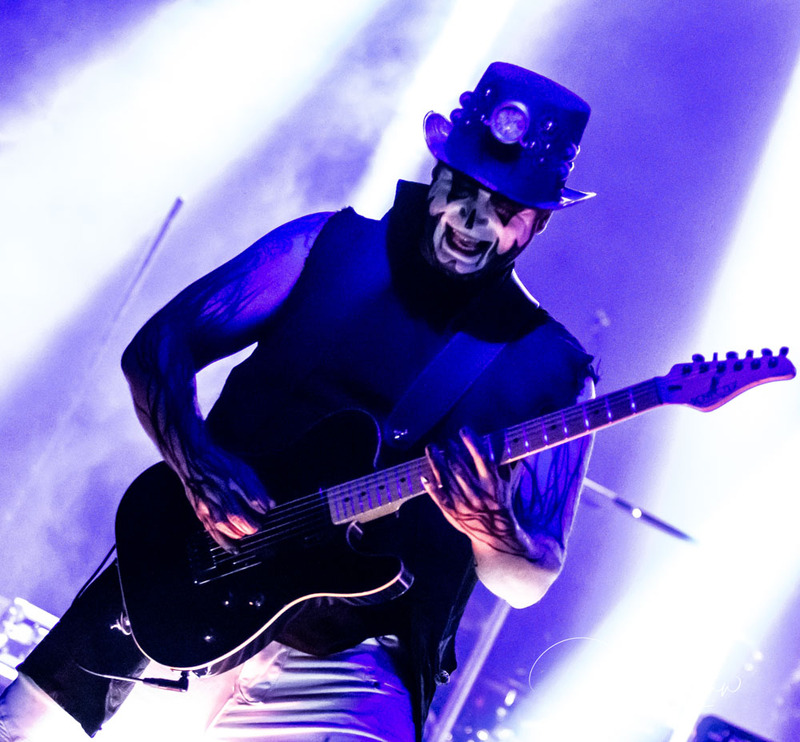 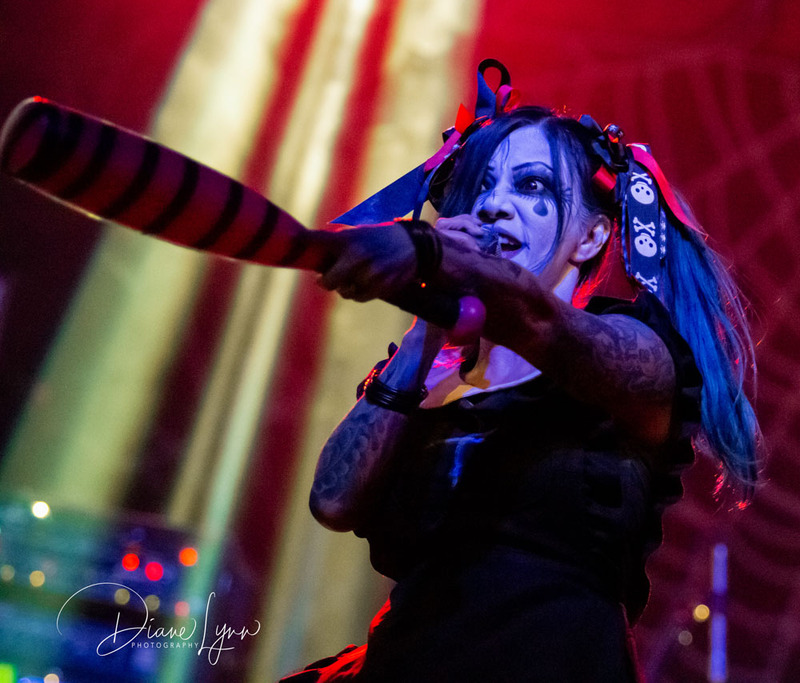 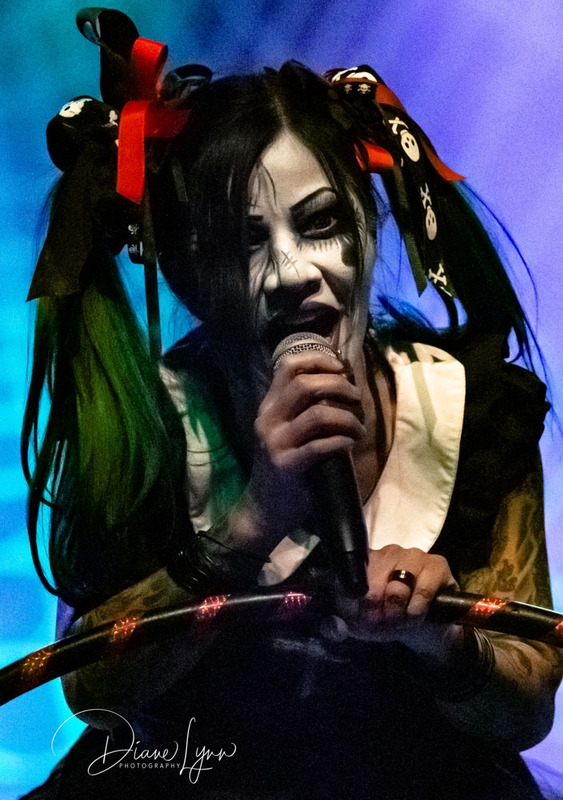 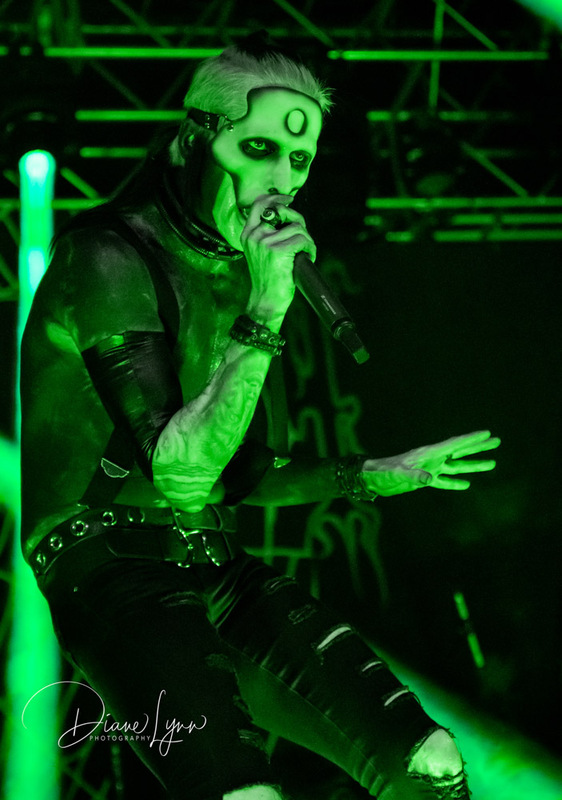 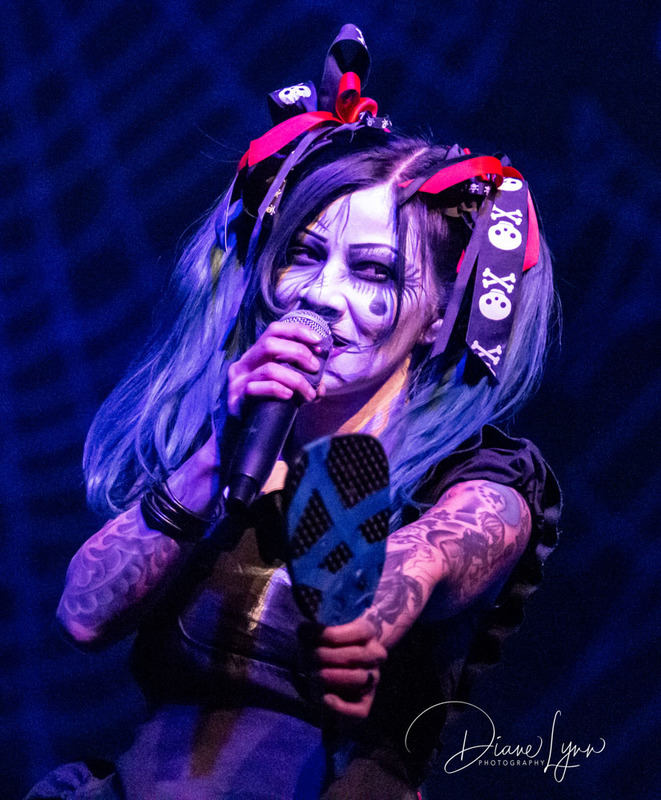 This dark carnival show was an awesome start for an evening of evil, horror and theatrics. Their performance was entertaining, and the music was captivating. 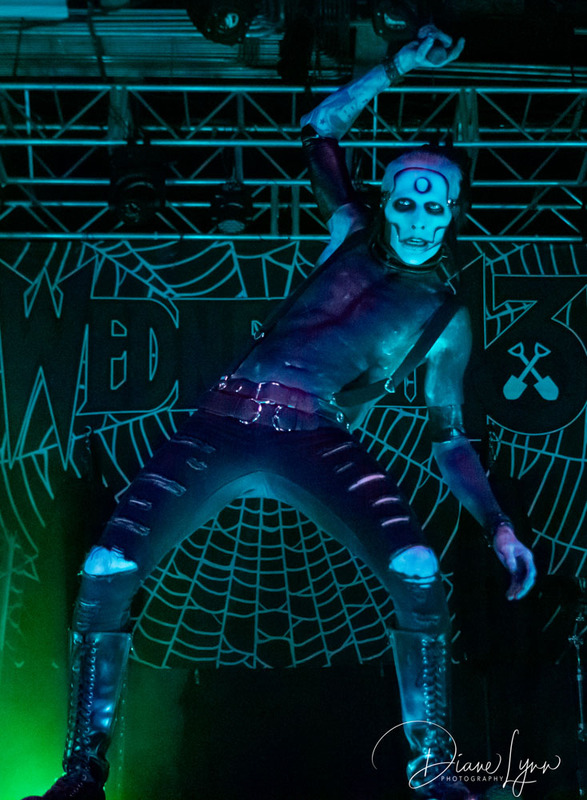 They were clearly the first of three headliners this night! I hope to catch this band again soon!